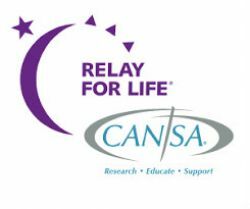 The theme for the relay is "CANSA Carnival". Hundreds of people took part in this event to give hope and support to every cancer survivor. The field was packed with teams wearing colours which depicts different form of cancer, the teams are also made out of various local and regional businesses and government institutions. This event also serves as a fundraiser for cancer and it continued throughout the night, providing entertainment from different artists. Dignitaries such as Mayor Melvin Naik are also part of the event.Rotarians and Interactors from York High and Rundle college took part in the Relay and provided refreshments through the night! 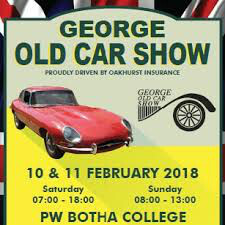 The 23rd George Old Car Show took place on 9 and 10 February 2019. Once again The Rotary Club of George stepped up to help make This year's show a huge success which focused on rare and exotic cars exhibited by proud owners from all over the country. At the end of January, between 700 and 800 vehicles - most of them manufactured before 1975 - had already been registered for the exhibition. In addition to the veteran and classic cars, new models, fascinating stationary engines and more than 5 000 model cars were also exhibited. A number of stalls were selling a range of car accessories, spare parts and novelty items, as well as other goods. There were food and refreshment stalls in abundance offering a choice of delights for all age groups young and old. 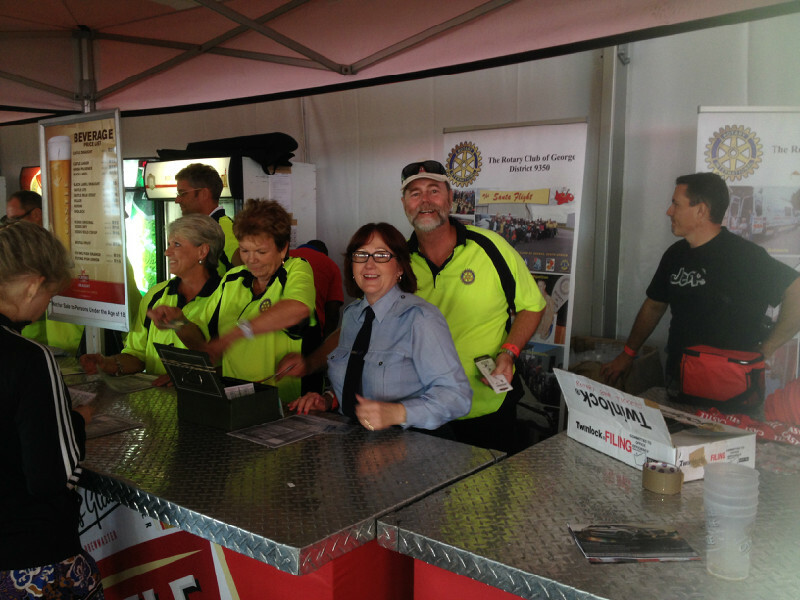 George Rotarians provided much-needed rehydration, running a beer tent for the crowds of nostalgic car enthusiasts. The auction of vintage, classic and sports cars, hosted by House of Classic & Sports Cars Knysna, provided a highlight yet again. "Around 80 percent of the exhibitors come from outside the George municipal area. We would like to heartily welcome visitors who support the George Old Car Show, whether by exhibiting or just visiting to admire the ageless beauties," said Japie Beyers of the organising committee. "We would also like to thank all our sponsors, without whom the show would not be possible." 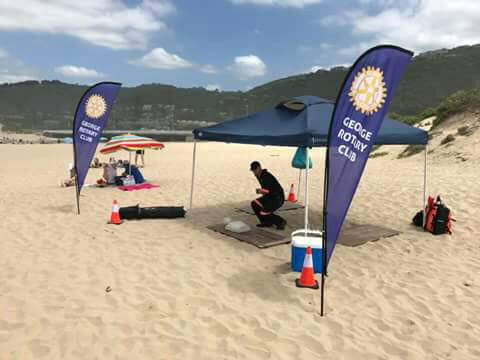 George Rotarians once again enjoyed the challenge of serving the community and raising much needed funds for the local sea rescue institute. 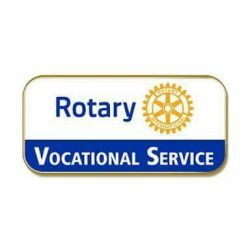 It has become common practice for Rotary clubs around the world to Recognize VOCATIONAL EXCELLENCE of the highest order, and to honor outstanding contributions by individuals or teams of individuals for significant advancement in their vocational fields and service to their communities, In doing so they exemplify the Rotary model of “Service above Self.” This is then recognized by Rotary’s Vocational Service Awards. These outstanding contributions also set an example to others, particularly the youth to strive for Vocational Excellence. 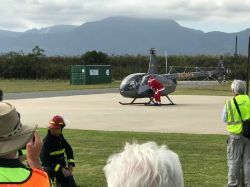 After the devastating fires in the Southern Cape last year, it was decided to reward a few individuals that had done something really special. We approached the two fire departments, Garden Route & George Fire and the SPCA. In all three cases we were informed that nominating individuals was not in any way possible as everyone, including the admin staff had done their bit, and walked the extra mile to fight this devastating catastrophe. George Rotary was therefore proud to host an auspicious evening and were given presentations by each organisation on the scope and magnitude of the fire and their involvement in fighting to keep it under control and eventually extinguished. President Frances Feig and the Clubs Vocational Services Director Phoebus Minkner then awarded all the Recipients as a ‘team of individuals’ who went above and beyond vocational excellence in service to the community, with an “Rotary Vocational Service Award”, this is a world recognised award and one that they were very proud of accepting and will be displayed with pride and honour. GEORGE AIRPORT - Once again we brought ALL the George Service Clubs together to carry out this unique Christmas project to benefit the youth of George. 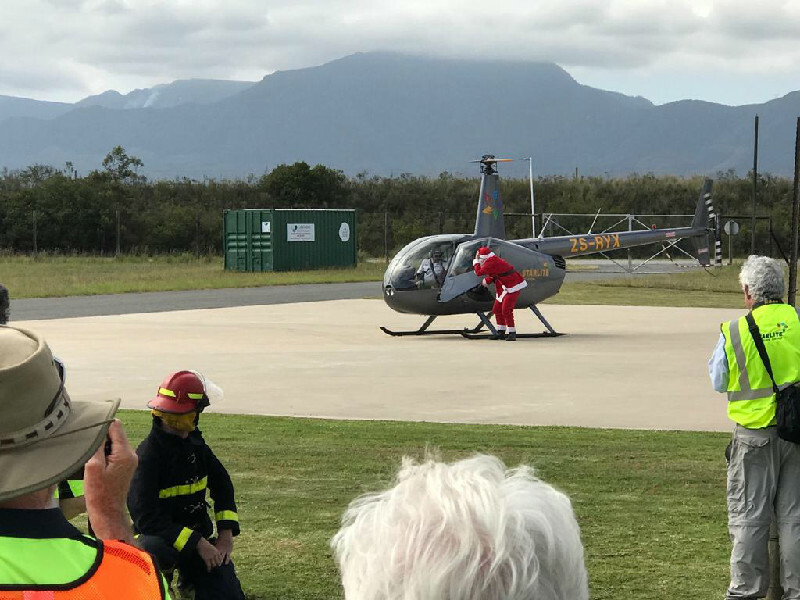 – all the planning, meetings and coordinating was made worthwhile, after seeing the delighted faces and hearing comments such as this one from a child just coming off his flight; “This is the most amazing day of my whole life!” Santa and his band of merry helpers from Six service clubs, including Rotary and interactors toiled away in the midday sun at the George airport on Saturday 8th December, organising the Santa Flights, catering and entertainment for 75 excited youngsters,It was a day of special happenings for the kids: paintball, tombola, face-painting and colour hair-spray, ball games presented by Living Ball, jumping castles and all kinds of yummy treats to eat and drink. Each kid received a specially made "ticket" which allowed them to board their planes. Children were given rides in dream sports cars. George is the only town in South Africa that does such a project and it is also the only project in the world where six different service clubs come together to do a community project of this nature. 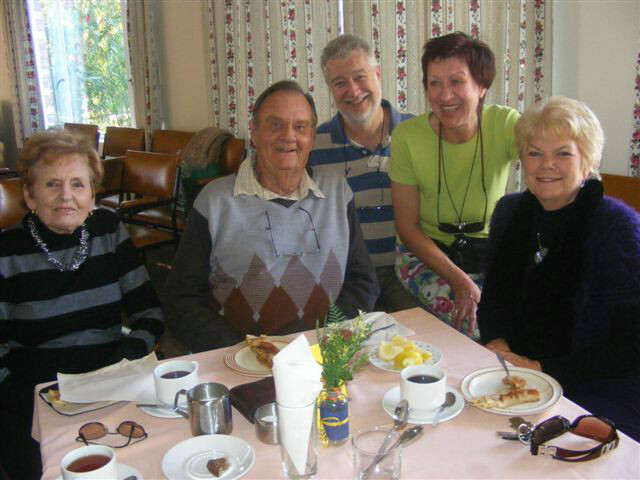 • The clubs involved are: Round Table, MOTH, Rotary, Eden Lions, Ladies Circle and Die Vryburgers of George. Rotary Interact (the junior club of Rotary) and the Holy Cross Leos (junior members of the Lions) help on the day with the games and proceedings. The GR SPCA staff was extremely grateful to RotoTank, Cape Town for the very generous donation of 5 x 5000 litre water tanks and 10 sturdy drinking troughs (valued close to R50,000). Hendrik Helberg and Christo van der Merwe from RotoTank in Cape Town sent the donation which was handed over by their George branch manager, Elvin Wentzel during the height of the recent fires in and around George. 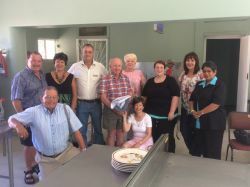 The donation was also facilitated by George Herald Editor Ilse Schoonraad and Rotary Club Community Service Director Donald Goldfain who got hold of the correct people at the GR SPCA to expedite the delivery and handing over. 2 of the tanks and 4 troughs will be sent to the Mossel Bay branch of the GR SPCA to assist the staff there. The tanks will be connected to the downpipes to ensure a constant supply of water at the 2 branches. The troughs are being used in the large animal pounds and some taken to areas that have animals without water after the fires. They will be invaluable during droughts and other disaster scenarios in future. The SPCA has mobile water tanks installed on some of their vehicles for animals without water so the troughs are prized by the field staff. 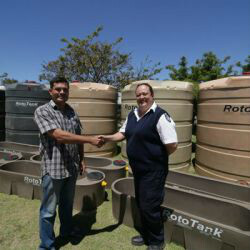 “Thank you very much to RotoTank,” said GR SPCA Frieda Jansen van Rensburg when the tanks were delivered, “we cannot believe the extent of their compassion and generosity and are all delighted by the donation. We will definitely put the tanks and troughs to good use and be even more ready for disasters in the future. We learned a lot after the Knysna fires and bought a lot of emergency equipment afterwards which was put to good use over the last few weeks. Now we have better facilities for storing and delivering water in emergencies as well. 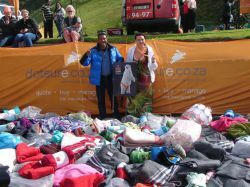 I’d like to express my gratitude to Ilse ( George Herald) and Donald (Rotary Club of George) for their participation in co-ordinating this wonderful donation” she concluded. 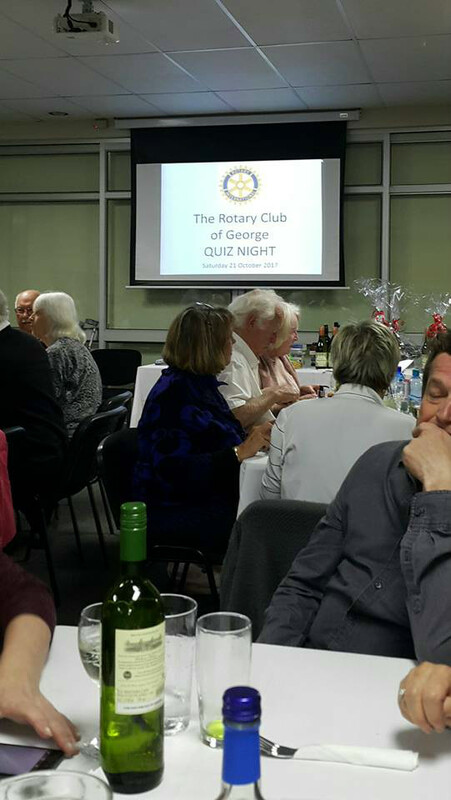 Saturday 17th November saw the much anticipated return of the Rotary Club of George Quiz Night. This event, organised as a fundraiser for the many projects done by the club was initiated and organised by President Elect Carryn Trollope. 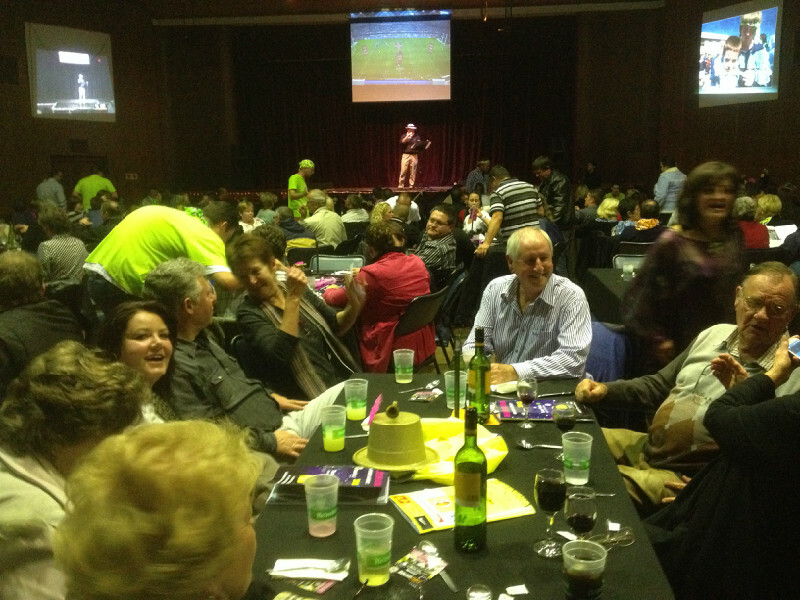 The evening was a full house and attracted 100 eager participants, all keen to pit their wits against each other and our quizmaster and compere, Anthony and his team, kept the evening in good order with a tour de force performance. It was a wonderful evening, full of head scratching, fun and laughter; a delicious menu of fish and chips, delicious salads, and desserts. The winning team from the last quiz were back in force, but they (and the other 12 participating teams) battled against strong teams of competitors determined to win the evenings prizes , all who scored an impressive number of points, answering questions on rounds which covered science, history, sport, the 90s and celebrities, amongst others, to be crowned Quiz Champions 2018. 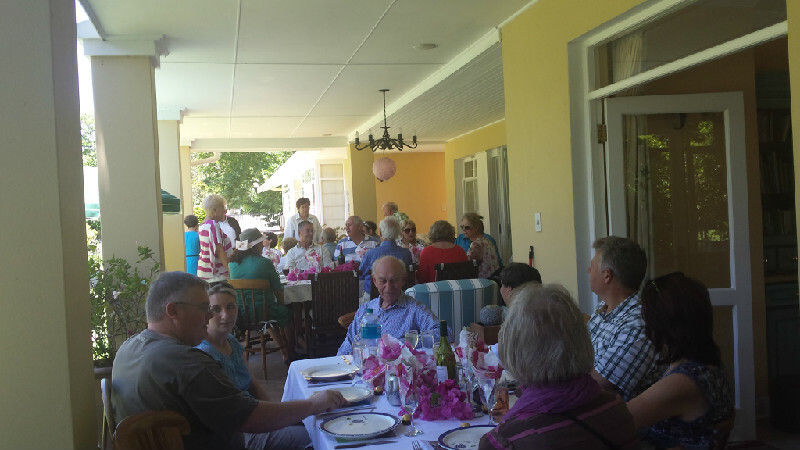 The Members from the Moths provided and served the excellent supper and refreshments, helping, in the process, to raise funds for the Rotary Club of George. 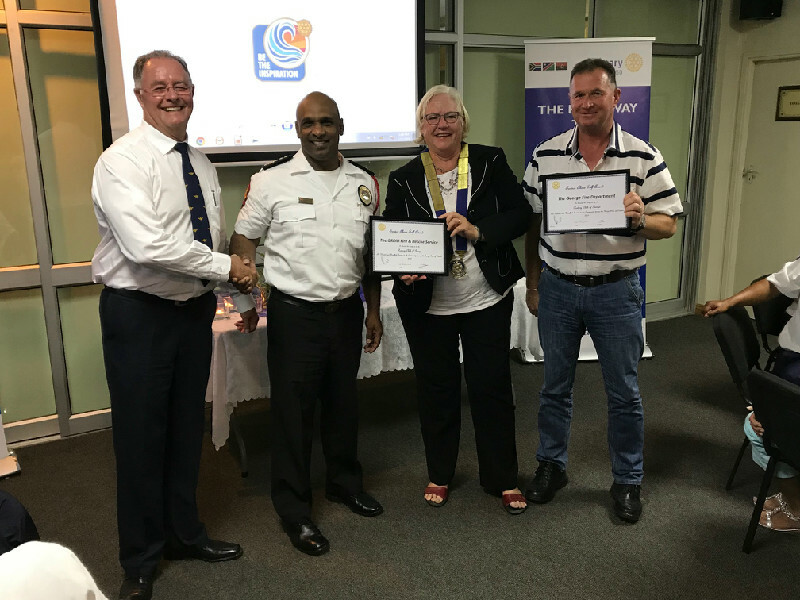 Tears, fear, loss and despondency of George fires – how a community came together - Well done Rotarian's - “Service Above Self”.Rotary and WRRA join hands to help our homeless fire victims ! Wilderness Residents and Ratepayers Contributed funds to WRRA specifically earmarked for food for the 100 victims of the recent fires, who were all being housed by Sanparks at Ebb& Flow. 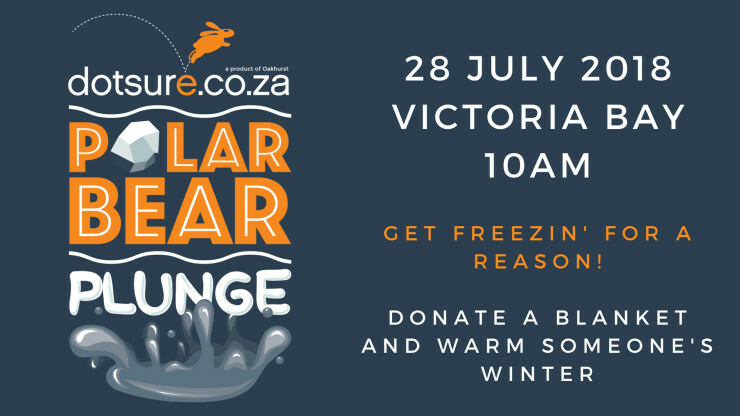 The funds raised are being used by the WRRA, Sanparks Honorary Rangers and Rotary Club of George to provide staple food packs to feed 100 people for the next month. The food was purchased from DF Scott, Golden Harvest and Pick&Pay Sedgefield, all of whom gave Rotary a significant discount on their purchases. In addition, other food stuffs and sandwiches were delivered to Ebb&Flow by concerned citizens and civic organizations. Hot balanced meals from George Super Kitchens were paid for and supplied by WRRA to all the victims from Tuesday to this weekend. Featherbed from Knysna will be feeding everyone today and Sunday and the food packs will be distributed today. Further food supplies will be supplied by WRRA & Rotary in two weeks’ time. Councillor Marlene Barnardt from CAW Municipality is providing baby food and toiletries. Great joint Community Co-operation. Donald Goldfain, on behalf of WRRA and Rotary. 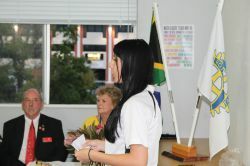 Each year, the Rotary Club of George sponsors a Rotary and Department of Education Eden (Garden Route) and Central Karoo District High School speech contest. The contest provides a valuable opportunity for young men and women in these communities to demonstrate and enhance their skills at developing a theme and presenting it to others in a convincing manner. The contest is open to any and all High School students in the municipal area. Each contestant is asked to speak for 5 to 7 minutes on the theme of their choice. A panel of Rotarian adjudicators evaluate each contestant on delivery, originality, and content. There are three rounds of the competition. School administrators assist with organising the elimination rounds. The Speech Contest Finals are held at a central location every year. 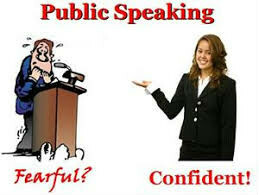 Increasing cash prizes are awarded at each level of competition and the learners gain valuable lessons in confidence in public speaking and debate . The George Service Clubs Rotary, Lions, Moths, Ladies Circle, Round Table, came together again at our annual “Pensioners Braai”, preparing meals for the elderly, all from local George retirement homes. 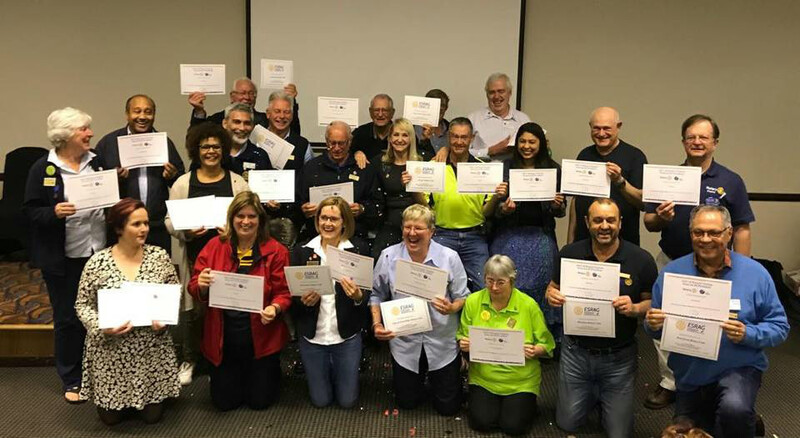 “This service is provided to the elderly free of charge as a form of appreciation for their contribution to the advancement of the communities of the Garden Route during their economically active years,” A true ‘Service Above Self’ Rotary Day! THANK YOU! District Governor Casper Kruger Club visit Tuesday 4th September. 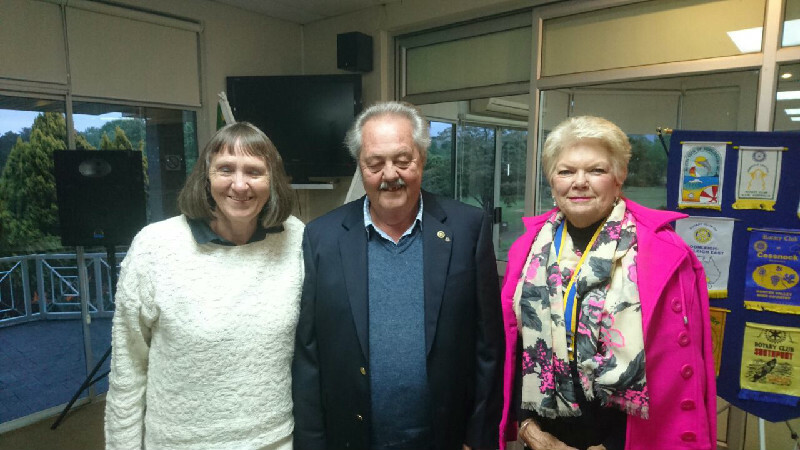 It was our immense pleasure to welcome our District Governor Casper Kruger to the Rotary Club of George, where he attended a meeting with the board prior to meeting with the members and their partners for a lovely Dinner, where he gave an uplifting message and encouragement of fellowship, and It was a wonderful opportunity to honour our District Governor and to show our solidarity to the ideals of Rotary International with this year’s presidents theme,”Be the Inspiration”. 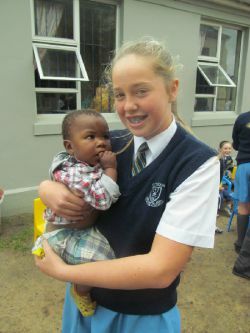 The next day he was shown two of our Global grant projects at Bethesda and Zenzela. 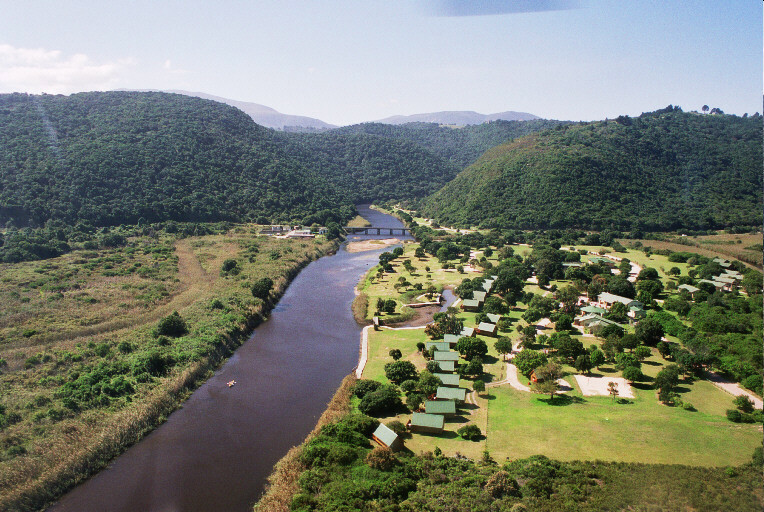 Featherbed Nature Reserve is a privately-owned reserve and South African Heritage Site that captures the essence of Knysna’s beauty. 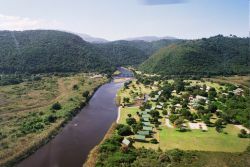 Located on a protected portion of Knysna’s Western Head, an iconic landmark on the Western Cape’s gorgeous Garden Route, the reserve is only accessible by ferry. To protect its natural splendor, only a limited number of people are able to visit each day and must be accompanied by a specialist guide. 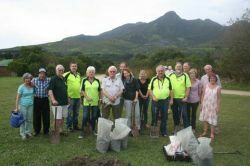 Rotary George recently sponsored 25 trees to be planted in the reserve to replenish those lost to the devastating fire in June 2017. George Rotarians were out in force and manned the refreshment tent dispensing 500 hot beverages and biscuits to those brave enough to take the plunge, and for their efforts Rotary received their share of some 750 blankets which they promptly re donated to the George child and family welfare clinic. 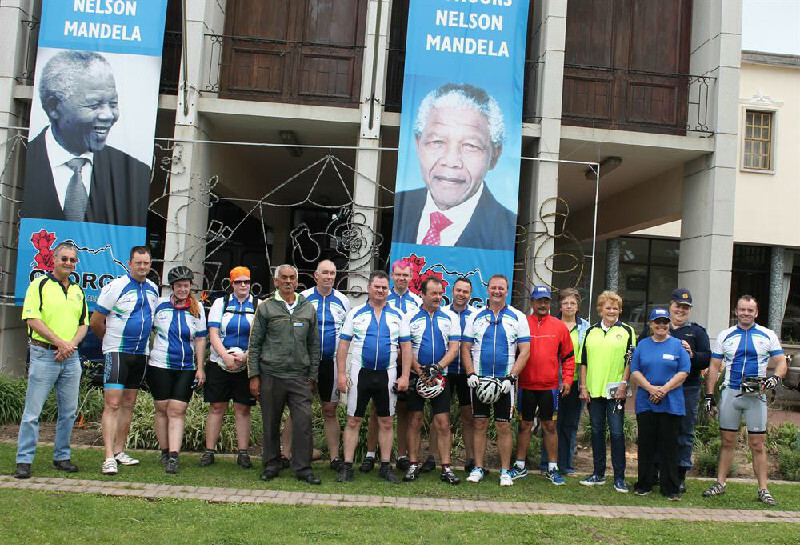 What did Goerge Rotary do for Mandela 100 day! 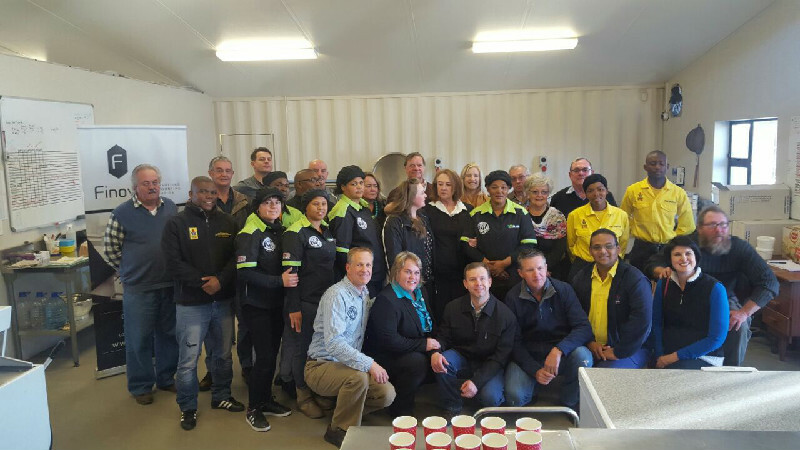 The staff of Oakhurst Insurance George took time out of their busy workday schedules to pack food parcels for surrounding communities, which will feed in excess of 28 000 people. Oakhurst donated 6 000 meals to George Rotary, 6 000 to Child Welfare and another 6 000 are going to Keep The Dream Rehabilitation clinic. The rest will be donated to various clinics and charity organisations across George that are all in desperate need. The 1000 food parcels donated to George Rotary Club were gratefully received and George Rotarians took the opportunity to do their 67 minutes for Mandela day by donating them in turn to those less fortunate in the local community, and reaching out through Blanco, Kuyasa, Parkdene and Lawaaikamp Clinics in and around George. More than 30 people attended the George Rotary Club’s induction Lunch recently. 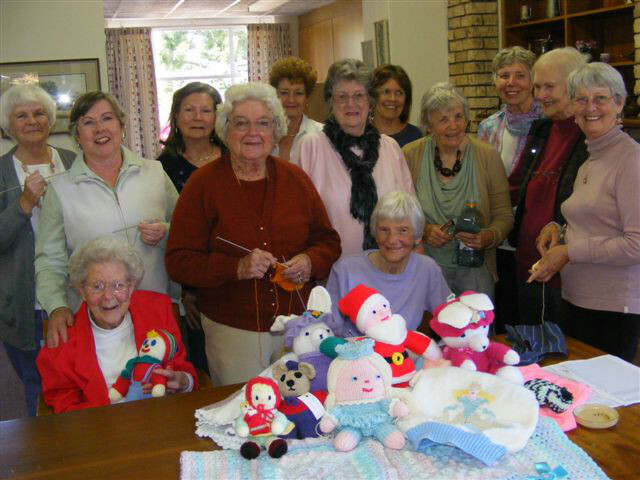 The theme was ‘A Teddy Bears Picnic’ each Rotarian was requested to bring a soft teddy toy to be donated to a local trauma Clinic. The event was held at the Far Hills Hotel for the induction of president elect, Frances Feig, by ADG Di Kershaw. Honoured guests included; Visiting Rotarians from neighbouring clubs, former ADGs and Presidents of Rotary and current members of the Rotary club of George and their partners and representatives of Interact. After the call to order by MC PP Andrew Jefferies a moment of silence was observed for the late PP Malcolm Pollard, President Simon Swan then welcomed everyone and this was followed by the Object of Rotary and toasts aplenty proposed by Rotarians to South Africa, Rotary International, recognition and appreciation of the Rotary partners and friends of Rotary, and finally grace. 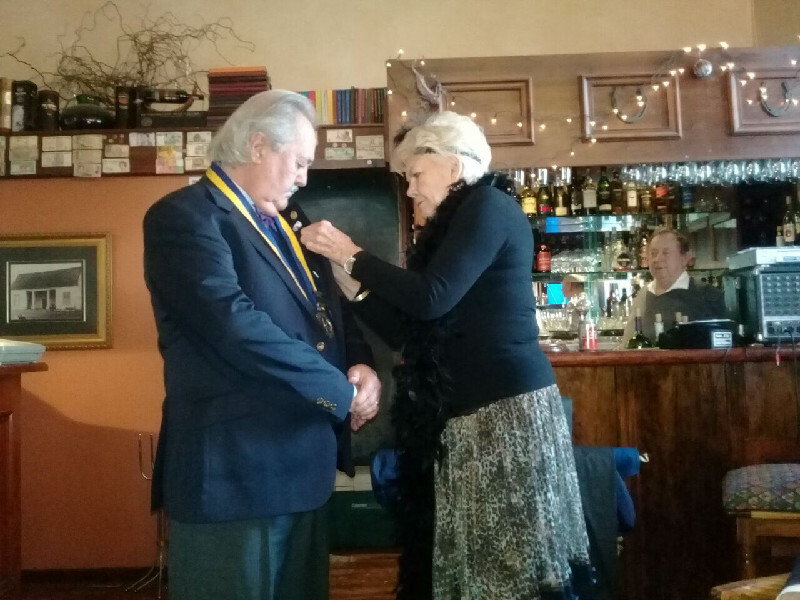 After the delicious Italian style buffet, President Simon Swan presented his outgoing address and annual report, proceeding on to the Club Awards given to a member who exhibits “Above and beyond qualities” in their daily activities and who promotes Rotary by their actions and involvements. 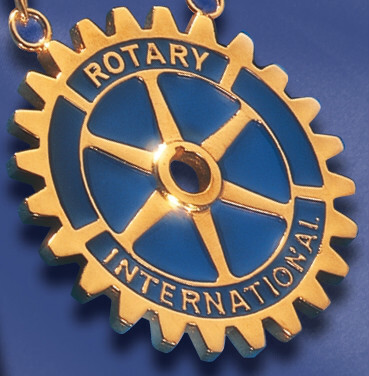 Congratulations AG Di Kershaw - “Presidents Award”; Rtn Dave Hill – “Service above Self Award”; Lynn Gibbs – “friends of Rotary Award”; PP Donald Goldfain – “Chirper of The Year Award” ( And a recipient of a PHF sapphire); Rtn Christo Prins – “Best Attendance Award”. The occasion was an intense as well as touching affair when President Simon handed over the Awards to members. The ADG Di Kershaw then gave her appreciation of the hard work and congratulations to President Simon and The Rotarians Of George Rotary for their achievements this year, no less for winning a Club citation this year, and the District Award for the ‘Community Service Project of the Year’! 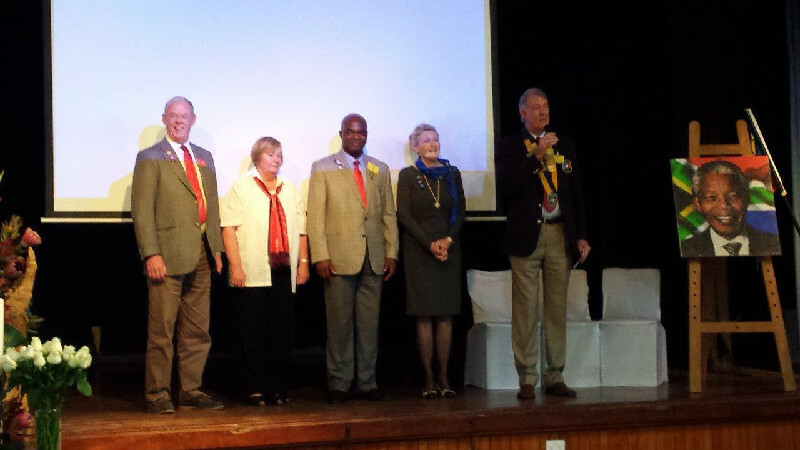 The induction of the new president of George Rotary then took place, and Incoming President Frances outlined her goals and aspirations for the incoming year under the RI Presidents theme for this rotary year of “Be the Inspiration”. The Induction ceremony being concluded and a new President inducted; the now Past President Simon closed proceedings with the 4way test and the MC called Rotary time; Fellowship then concluded a wonderful afternoon. 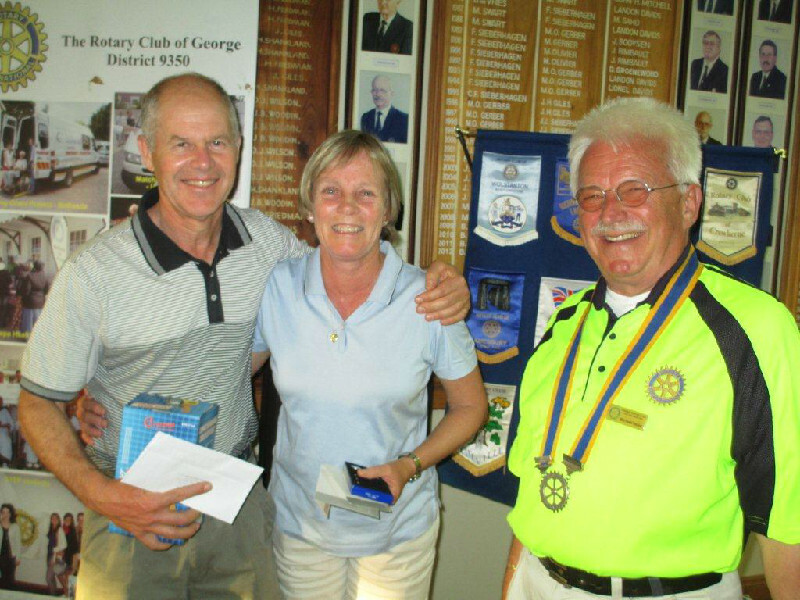 Our annual golf day fundraiser took place on a chilly Sunday on the 10th of June at the George Golf Club, but this did not deter the enthusiastic Golfers and the George Rotarians from enjoying the day, a major fundraiser! This annual event has only been a success since its inception thanks to the support of the local golf community; its aim has always been to raise funds for the greater George Community and Make a Difference in people’s lives. 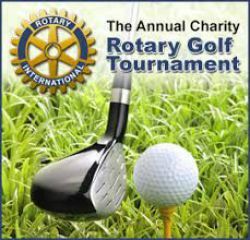 The Rotary Club of George members raise funds for the many projects that we support through Voluntary Community work, Events and Fundraising Projects such as this Family Golf Day. Thanks go to the Rotary Golf Day organizing team that put this amazing day together and the George Golf Community for their support, a full field, great prizes, raffles and fellowship after the prize giving was enjoyed by golfers, Rotarian's and Friends of Rotary, especially the boerewors rolls and entertainment and the day was a great success. Three Georgians who are well known in educational and charitable circles were honoured for decades of dedicated service to the community by the George Rotary Club on Tuesday 29 May. 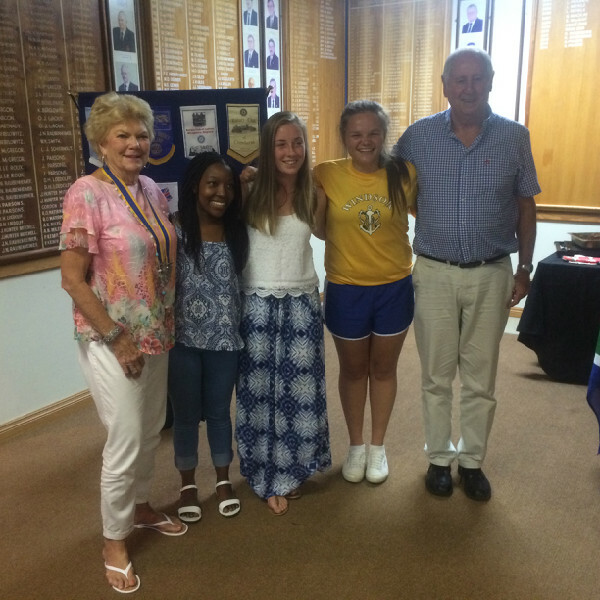 The Rotary's highest meritorious award, the Paul Harris Fellowship, was awarded to Cansa Relay chairman Lorraine Verhagen, dedicated community worker Myron Rabinowitz and Di Dee, a teacher at York High who worked on many educational projects including the Interact Club. 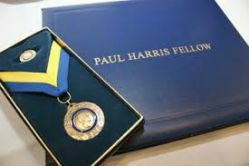 During an informal sit-down dinner, outgoing president Simon Swan reminded his audience that the presentation of the Paul Harris Fellowship is the Rotary Foundation's way of expressing its appreciation for a substantial contribution made to humanitarian and educational programmes. Certificates of appreciation were also handed to York High Principal Francois Moll, the Townhouse Restaurant and the George Golf Club. The fellowships and certificates of appreciation are bestowed on individuals, organisations and businesses that demonstrate the Rotary's motto, "Service above Self". International Firefighters Day (IFFD) allows the world to recognize and honour the sacrifices that our firefighters make to keep our communities and environment safe. Memories of the recent devastating fires that marred the Eden District in the Southern Cape will be forever etched on the collective consciousness of the community. 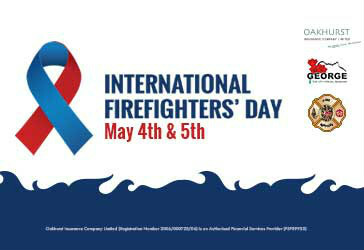 Firefighters dedicate their lives to the protection of life and property. 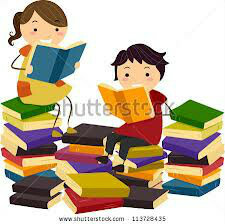 Sometimes that dedication is in the form of countless hours volunteered over many years and at times even their lives. 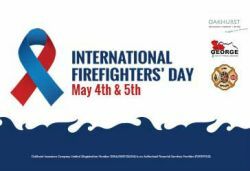 On Friday, the 4th of May, the world celebrates International Firefighters’ Day where we honour the bravery and commitment of these individuals. Proud Sponsor Oakhurst Insurance, along with the greater George community and the Rotary Club of George, will recognise the sacrifices that firefighters make to ensure that their communities and environment are as safe as possible. George Fire Department is gearing up for International Firefighters’ Day with celebrations kicking off with a Grand Parade of over 30 fire-fighting vehicles drawn from Fire Departments across the Western and Southern Cape. On Saturday 5 May, eight firefighting teams including one ladies team will showcase their skills with challenges such as the "Hose Roll", the "Fireman’s Carry" and the "Tyre-flip", Medals for the winning teams were donated by the Rotarians from George Rotary Club. Demonstrations will include extrication from a vehicle accident, fire-fighting vehicles on display and a ‘potjiekos’ competition with six teams taking part. The food prepared will be donated to a worthy cause by the Fire Departments. 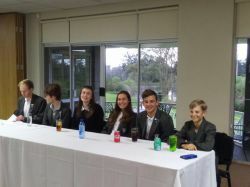 An Interact Mini-conference took place at York High, George on Saturday 21 April 2018. The conference went off extremely well with an attendance of 135 (115 Interactors and 20 teachers and Rotarians) from 10 Interact Clubs. 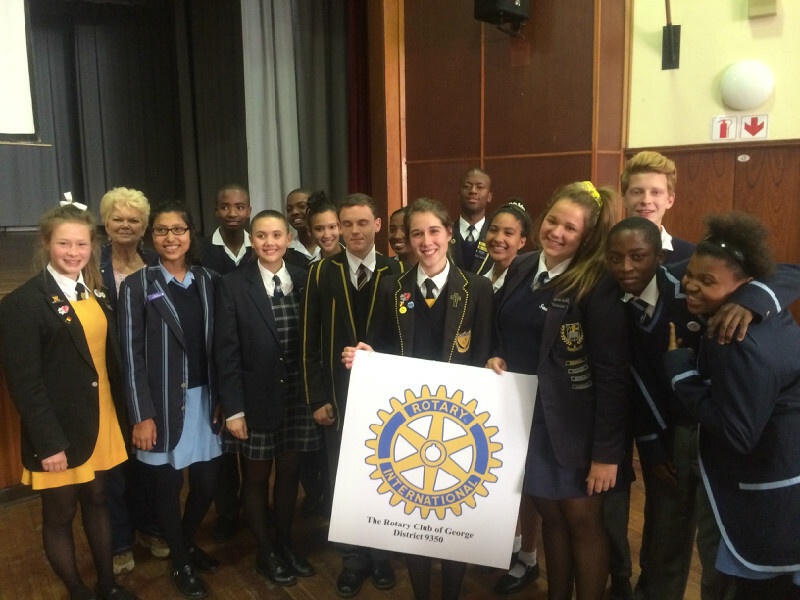 The Interact clubs came from Swellendam, Mossel Bay, Great Brak River, Dysselsdorp, Knysna and George. There was a varied and fun programme with 2 motivational speakers, a slot on Rotary Youth Exchange, and an opportunity for each Interact Club to make a presentation, this was followed by a Workshop. Our grateful thanks goes to a wonderful group of Rotarians who gave up most of their Saturday to do the catering for the conference, namely Michele, Carryn, Frances, Lynn and Cheryl, and Donald, Phoebus and Dave. The teas served were very excellent with home baked scones and Rock buns, and freshly made sandwiches. The boerewors rolls were expertly prepared and we received many comments on how delicious they were. Thank you to a wonderful team. CANSA ‘’Relay For Life’ is a unique event that offers everyone in their community the opportunity to participate in the fight against cancer. It represents HOPE that those who are fighting cancer will be supported; those lost to cancer will never be forgotten and one day cancer will be eliminated. CANSA Relay For Life embraces entire communities, from the very young to the old. Teams raise funds before and during the Relay and these funds are dedicated to funding CANSA’s unique, integrated service within their community. Rotarians from The Rotary Club of George and Interactors from York High and Rundle College, provided refreshments, coffee, tea and pancakes through the night to the participant’s, and the George interactors led the Rotary team through the night! Relayers take a pledge during a Fight Back Ceremony to take action and spread awareness of cancer education, advocacy, screening as well as care and support programmes – all in helping to build a world without cancer. 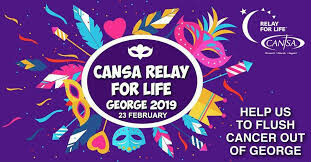 This year’s CANSA Relay For Life 2018 that was held in George was a great success despite rainy weather and raised R65.000. A wheelchair race exclusively for disabled athletes! The City of George annually welcomes more than 1500 of national and international participants and with the cumulative monetary and logistical support of ACSA George and George Municipality an event of international standards is put forward. 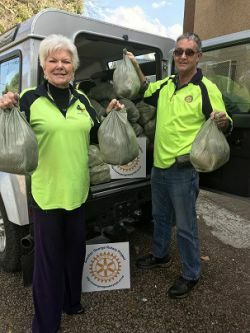 The Rotary Club of George is proud to be part of this unique event and have been involved over previous years with catering duties, this year was no different and Rotarians and Partners handed out 1500 food parcels to all the participants many of whom are Polio survivors. By becoming involved Rotary will make a conscious investment (however big or small) in the future of the local disabled community and impact on the national and international disabled communities, by giving a donation to Rotary Internationals “Polio Plus Fund”. 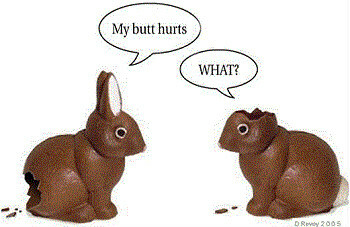 Every year it is getting bigger and better! The number of entries has increased dramatically, with disabled athletes and other persons in wheelchairs flocking to this annual event. 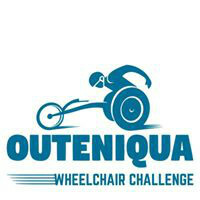 The Outeniqua Wheelchair Challenge has been staged successfully during the past fifteen years, growing from its humble beginnings of only 27 entries in 2002 (then known as the Outeniqua Chair Challenge -OCC) to the magnificent race it is today. 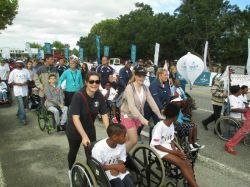 The Challenge is not only unique as being the first and only event exclusively for the disabled in South Africa, but it is staged in the picturesque town of George in the Southern Cape, and has over many years successfully hosted this event which is endorsed by the South African Sports Association for the Physically Disabled (SASAPD), South African Sports Confederation (SASCOC) and Disability Sports South Africa (DISSA). Athletes in racing wheelchairs, adapted bicycles, hand cycles, basketball chairs and ordinary wheelchairs take on the challenge which is not only about speed, but also endurance in different race categories which include the 42,2kmmarathon, 21,1km half marathon, 10 km race and a five kilometre fun event have made this into the premier sporting event for the disabled on the South African sporting calendar. It undoubtedly has the potential to develop into one of the best events of its kind in the world! The 22nd annual George Old Car Show took place on 10 and 11 February 2018. This event is hosted annually by the Southern Cape Old Car Club and the funds raised are donated to various local organizations. George Rotary Club members, partners and friends of rotary, host and run a very busy Refreshment and Beer tent for thirsty visitors and exhibitors, the profit from the proceeds from two days of bar duties, are donated to a selected local charity. A unique exhibition of classic and everyday vehicles from years gone by includes; a large number of other veteran and vintage vehicles, veteran tractors and farming implements, static engines, more than 5 000 miniature model cars, motorcycles, and vehicles displayed by new car dealers. Drive byes and concourse displays are organised for many of these amazing machines and the owners, some of whom dress in period costume, add to a festive and nostalgic atmosphere. Volkswagen's museum, the Auto Pavilion, will display five famous Beetles under the title "Meet the Beetles". These Beetles hark back to the British Officer, Major Ivan Hirst, who saved the Beetle from destruction after the Second World War and pays homage to the George Old Car Show's theme of British manufactured vehicles. The largest ever display of old Fords (pre 1930 Fords, which includes mainly Model N (1907), Model S (1907), Model T (1908 – 1927), Model A (1928 – 1930) will make a grand entrance upon completion of their tour through the Karoo prior to the show. The event has proven to be a flagship event not only for George and South Africa, but also for the International market. 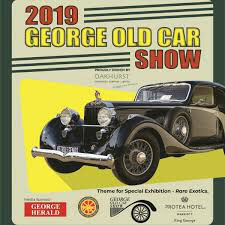 Annually more than 12 000 visitors flock to George to be a part of this quintessential show in the South African old car fraternity. George Rotary Club is proud to be a part of this prestigious event, fundraiser, PRPI exercise, and great fellowship. 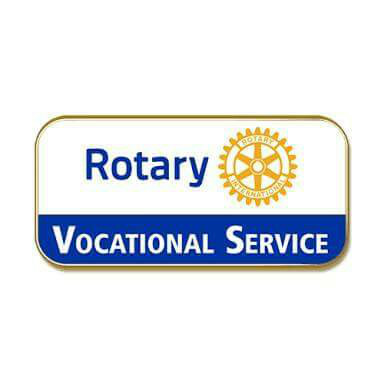 Each year the Rotary Club of George holds a Vocational Service Award evening where they recognize people in the local community who have shown that they give outstanding service in their personnel capacity or vocation. 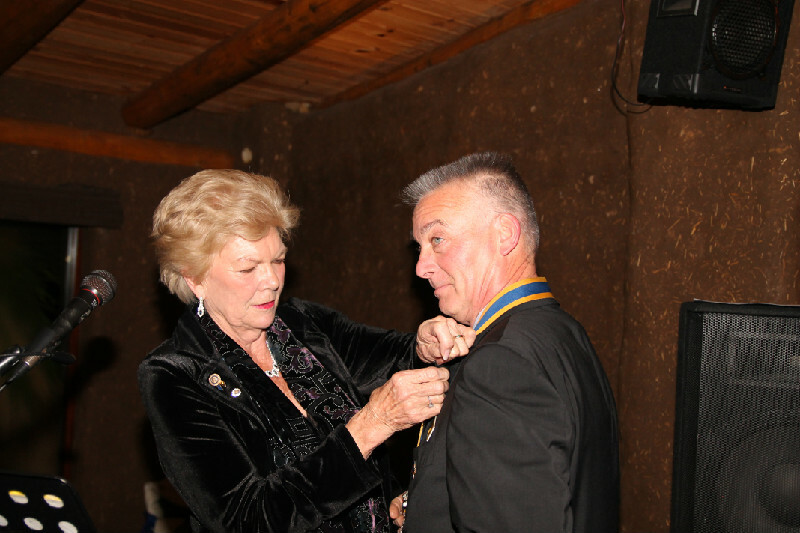 A number of candidates are nominated and between 6-10 awardees who qualify were recognized at a Special Award evening held at the George Golf Club, where their colleagues and families helped celebrate their achievements with members of the George Rotary Club members, their partners and friends. This is an annual award and is only given to a limited number of people in the community who George Rotary Club members recognise as being employees or individuals who give exemplary service in their vocation or selfless contribution to the community. As part of the Blue Flag programme’s education and awareness requirements, the Eden (Garden Route) District Municipality arranged for the National Sea Rescue Institute (NSRI) to demonstrate a sea rescue exercise at the Wilderness Blue Flag Beach on Saturday, 22 December 2017 and the 5th January 2018. The purpose of the demonstrations was to create awareness amongst the public about the risks that rip currents pose to swimmers and to educate the public on what to do if they find themselves in potential dangerous situations. The rescue team will demonstrate an exciting sea rescue attempt after which a CPR demonstration will be given. Educating the public on essential lifesaving skills can potentially avert the loss of lives through drowning. After the NSRI demonstrations the Eden District Municipality and the Wildlife and Environment Society of South Africa (WESSA) Tourism Blue Flag beach stewards will distribute information brochures on the beach as part of its environmental education activities. Amongst other strict requirements, the environmental education of visitors to the beach is a requirement of Blue Flag status. The success of the 2017/18 Blue Flag season depended on various stakeholders whose dedication and commitment throughout the season ensures a successful and save Blue Flag season. 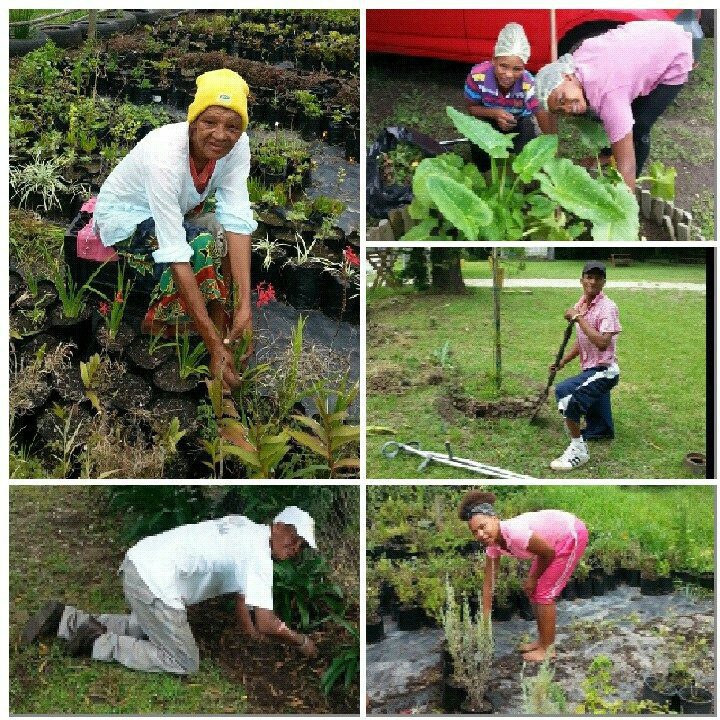 Some of the stakeholders involved are the Eden (Garden Route) District Municipality, WESSA, South African National Parks (SANParks), George Municipality, the Wilderness Ratepayers and Residents Association, and George Rotary Club amongst others. Recently the Early Act Club at Outeniqua Primary School concluded their latest community service project. Early Act is sponsored at primary schools by the international Rotary service organization and promotes caring, respect, empathy, responsibility, tolerance, citizenship, compassion, friendship and leadership. The learners at the Early Act club, assisted by their parents, made festive hats, knitted angels, obtained backpacks with stationary, baked cakes, supplied a Christmas tree and arranged for other treats for the get-together. 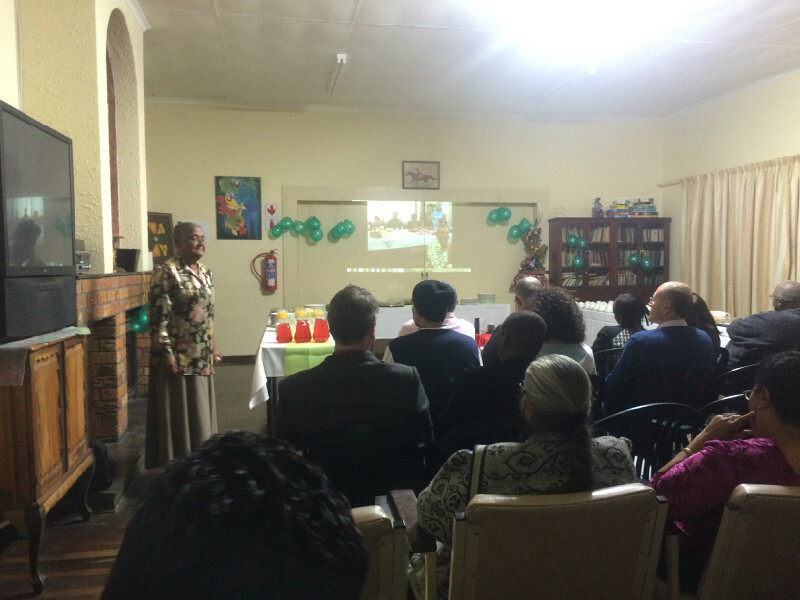 Sponsorships were also obtained from Total Sandkraal and the Reformed Church in George. 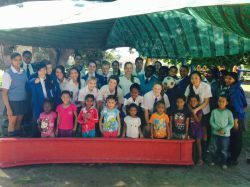 On the day of the visit a group of approximately 40 Early Actors arrived at the Wikkelwurms area at Bethesda, handed over the cakes, and then played with the children in the play area. Special recognition was also given to the children who are now leaving to go to Grade R, and each child was given a party pack to take home. On the accompanying photos some of the EarlyActors can be seen playing with the Wikkelwurms. Onlangs het die Early Act Klub by Laerskool Outeniqua hulle nuutste gemeenskapsprojek voltooi. Early Act word by laerskole deur die internasionale Rotary diensorganisasie ondersteun en bevorder omgee, respek, empatie, verantwoordelikheid, verdraagsaamheid, burgerskap, ruimhartigheid, vriendskap en leierskap. 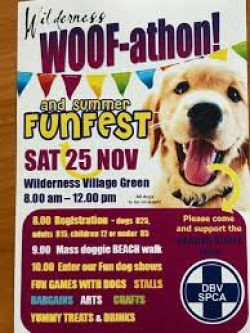 For the sixth year running, the Garden Route SPCA held their hugely popular Wilderness WOOF-athon on Saturday 25th November. As in previous years The Rotary Club of George marshal the dogs and their owners on the Beach walk and offer guidance and encouragement to the competitors! Last year, 200 dogs participated in the mass doggie beach walk and the fun dog shows. This year they hoped to have a record of 240 dogs and they nearly did! 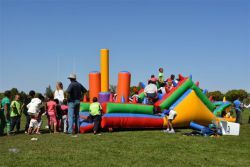 The fun is not limited to dogs and their owners - there was sizzling sosaties and bacon rolls, coffee and cakes, fairground games, the SPCA bargain book sale, and arts and craft stalls. Watching dogs and owners get in a real tangle in South Africa's first "Sausage and Spoon Race “it made attending worth every bodies while this year and the dogs and their owners enjoyed every minute of it with not a sausage left to race!. Registration opened at 08:00 (R25 per dog, R15 per human and R5 for kids 12 and under). The beach walk started at 09:00, the "Sausage and Spoon" races and fun dog shows at 10:00. Win a flight over the coast in a private plane, a R750 feast at Roxi's at The Palms Garden Square, a R500 Woolworths shopping spree, or a R1 000 hairstyling at Stylz? The funds raised will be used by the local garden Route SPCA to help animals in need; and Rotarians enjoyed giving their voluntary time for this worthy cause. 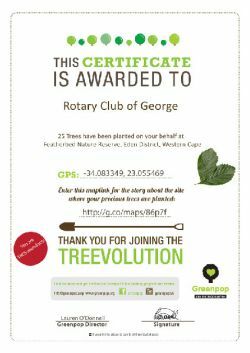 Rotary Club of George Members and Partners donated and planted 25 ‘Spekboom’ trees (1 for each member of the Club) in an area of the George Botanical Gardens for future generations to enjoy, this initiative was in direct response to the call by RI president Ian Riseley to all Rotarians to plant a tree on a ‘1 to 1’ challenge. 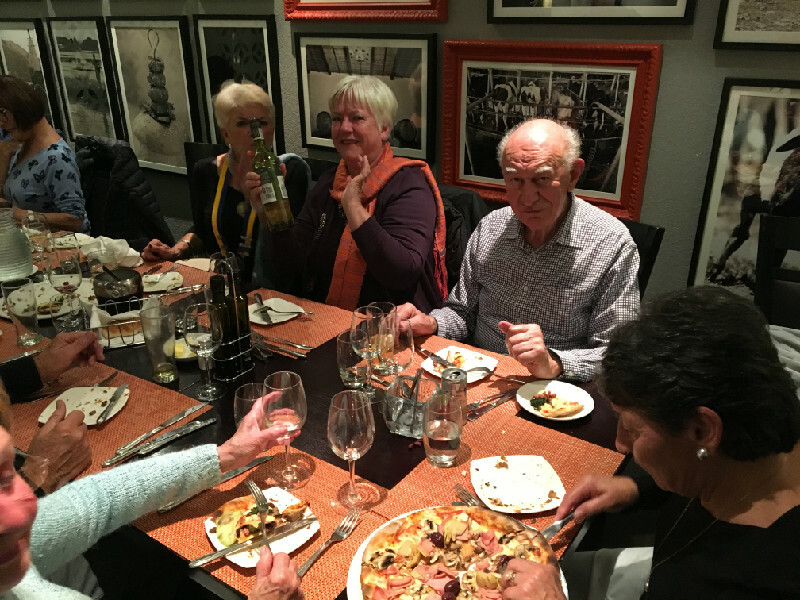 Rotary George took on the challenge on 31st October2017! ‘Spekboom’ (Portulacaria afra) is a succulent that helps fight air pollution. It has the ability to capture more than four tons of carbon per hectare! ‘Spekboom’ is a proudly South African plant! 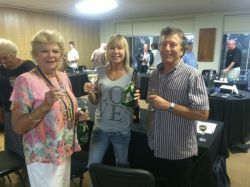 "Our first Rotary Club George Quiz Evening at the George Golf Club and it was a big success!! Thank you to all participants! You guys rock!" A Rotary Quiz Night was inaugurated this year hosted by the Rotary Club of George as a fund raiser for their Club Project Fund. 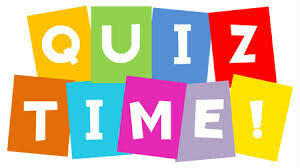 The event is a fun interactive night that welcomes the public, companies and Rotary clubs to enter teams to answer a series of questions and puzzles through a fun and exciting pub quiz format. A meal was served and the evening was attended by close on 150 people. The event began in the early evening and was held at the George Golf Club. The event has become a must do event in the local diary, and due to demand will be repeated in the New Year. The Club was honoured to have our District 9350 DG Lynette visit George on 2nd August and we were able to take her on an afternoon visit to some of our George Rotary project sites, President Simon, PP Di, PP Mike and Rtn Dave showed off our Bethesda projects, then Zenzelle and a visit to our George Interact project in Thembalethu. 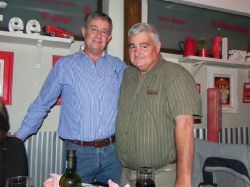 The evening finished off with a great fellowship evening at Lala's Restuarant in George. 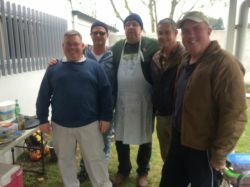 President Simon and Rtn Donald attended a "Thank you Lunch" at George Super Kitchen hosted by Mars van den Colff to thank everyone involved in feeding the fire fighter and victims in the June Knysna fires. Well done TEAM !! President Simon Swan was inducted at a Fun Filled Fellowship Function at The Town House restaurant on Sunday 2 July 2017. Have a look at the Gallery for some great pictures ! 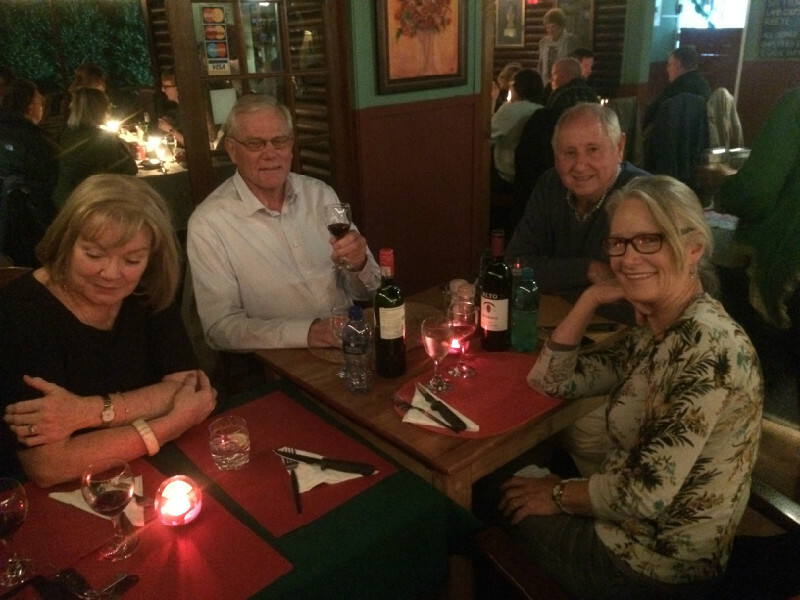 Great eveninhg of Fellowship at La Cantina at fancourt , George. Well organised by Rotarian Peter Gibbs ! 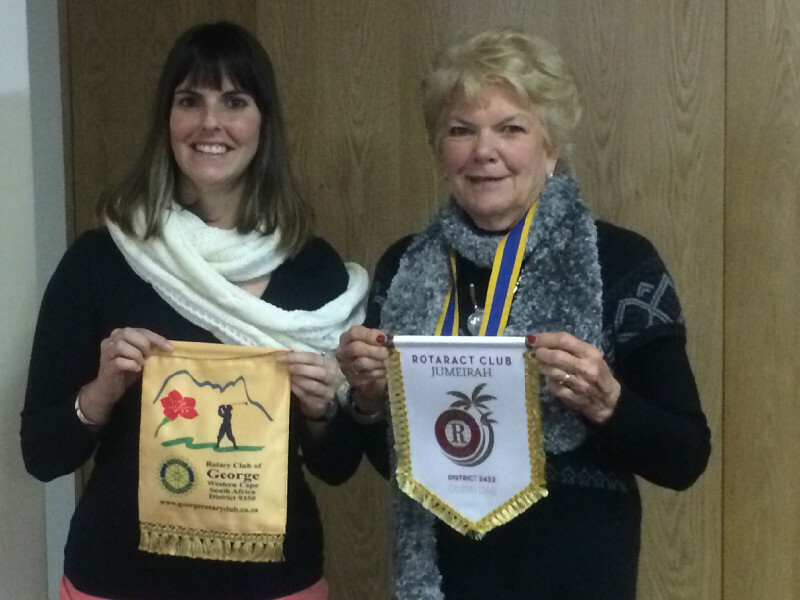 Recently the Rotary Club of George awarded Amanda Hattingh, a teacher at Outeniqua Primary School, with a Paul Harris Fellowship in recognition of outstanding service to the community. Named after the founder of the international Rotary organization, this award represents a donation of one thousand US dollars in the name of the awardee by the George Rotary Club to the Rotary Foundation, which in return supports humanitarian projects worldwide. Previous recipients of this award include Mother Teresa, Dr Jonas Salk and UN Secretary General Javier Perez de Cuellar. “Apart from her other activities at the school, Ms Hattingh has been key to the success of the Early Act Club over the past four years at Outeniqua Primary School,” Rotary Club president Di Kershaw explains. Early Act is sponsored at primary schools by the Rotary worldwide and includes as focus areas the promotion of a culture of public service, the development of leadership qualities and awareness of community needs. Current projects of the Outeniqua Primary Early Actors include the Wikkelwurms project at Bethesda, a stimulation project for children with developmental delays, and the collection of toys and gifts for the Red Cross Children’s Hospital. On the accompanying photo is Wilhelm van der Vyver, Rotarian liassing with Outeniqua Primary Early Act Club, Amanda Hattingh with her award, George Rotary Club President Di Kershaw and Johan Smit, principal at Outeniqua Primary School. Rotary Club of George facilitated a R20,000 donation by Garden Route Mall o the Wilderness Heights Community Medical Project , run and administered by Hope Church Wilderness Heights. Funds were handed over to Rotary and Annalie Cable by the Mall’s General Manager Rion Olivier and Andrea van Rensburg. Rotarians Ian Rowan, Donald Goldfain and our Rotary guest, Dave Hill. The funds will be used to stock up on medical supplies, such as bandages, paraffin gauze, antibiotic creams and other medical products used to treat injuries of residents the Wilderness Heights informal settlement. Annalie Cable, the dedicated Florence Nightingale running the project extends an invite to all Wilderness Residents to drop in and see what good work is being done here for our community. 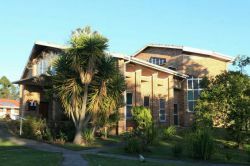 The centre feeds around 50 children , old age pensioners and invalids and about 10 volunteers twice a day . 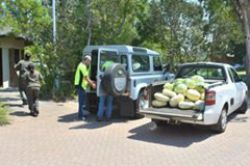 Locals earn points to spend in the JOY SHOP by packing food for the food packing project, making handmade bead jewelry, earning points by collecting recyclables and also by working in the gardens and veggie patch. Please take the time to stop in and see what is happening at this heartwarming and uplifting project, RIGHT HERE IN WILDERNESS ! Rundle Interact Board at our George Rotary evening on 27th September giving their report back for 2016. They were super and looked so smart. The young team did Rundle proud. 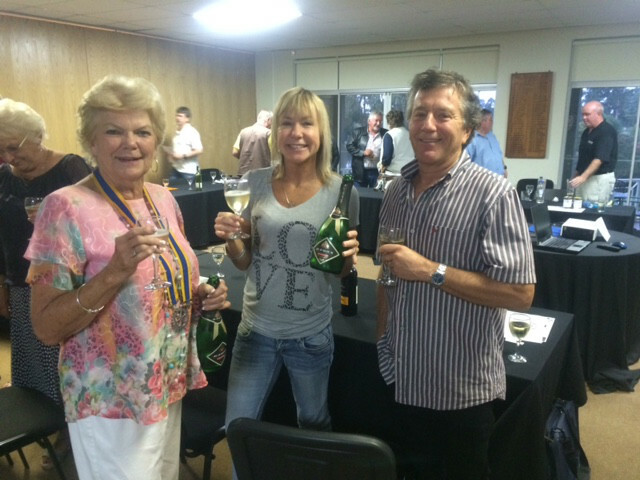 Special thanks to the Badger Holdings Team ,Oakhurst Insurance & dotsure.co.za for arranging this spectacular event. 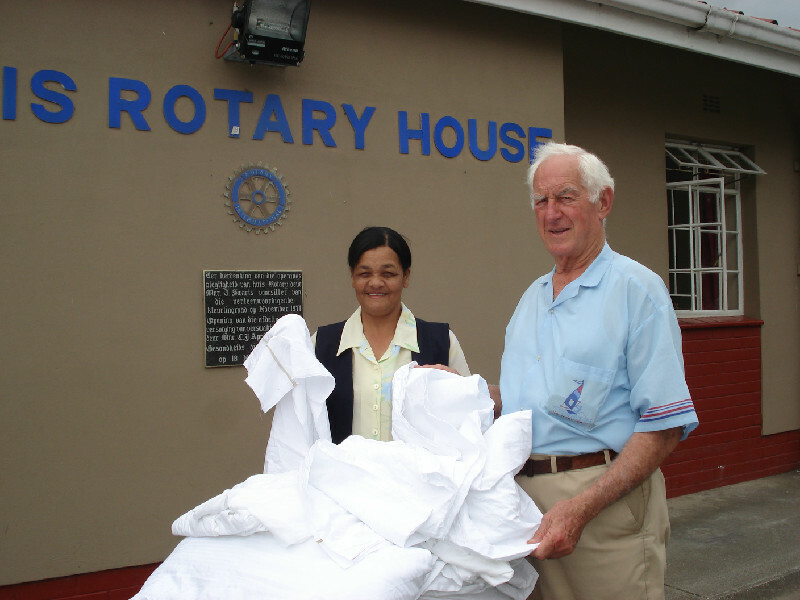 A total of 448 blankets were donated by the polar bears who took the plunge and of these, George Rotary Club received 140, which were immediately collected by Bethesda for the patient outreach project. Thanks to all the Rotarians , partners and friends that came to hand out all that coffee to the freezing participants. We all look forward to this event becoming an annual fixture at Vic Bay ! York High Interact held an extremley well run and well attended regional Interact conference. Over 100 delegates from schools in the Garden Route attended. George Rotary can be proud of it's York High Interact Team. Bravo ! 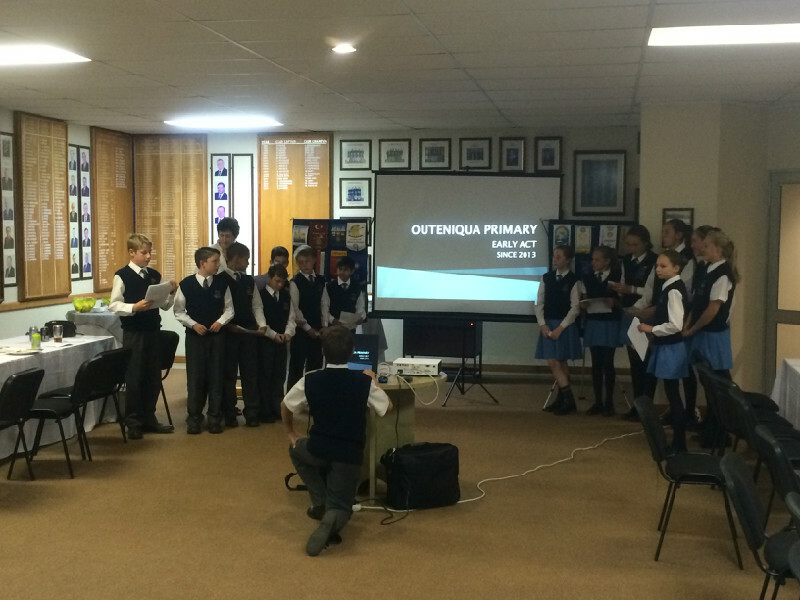 The Outeniqua Early Act Club visited our Club on Tuesday evening. Ms Amada Hattingh presented a slide show of the Early Act Club’s impressive activitivies . Rotarians in the making, all of them  ! 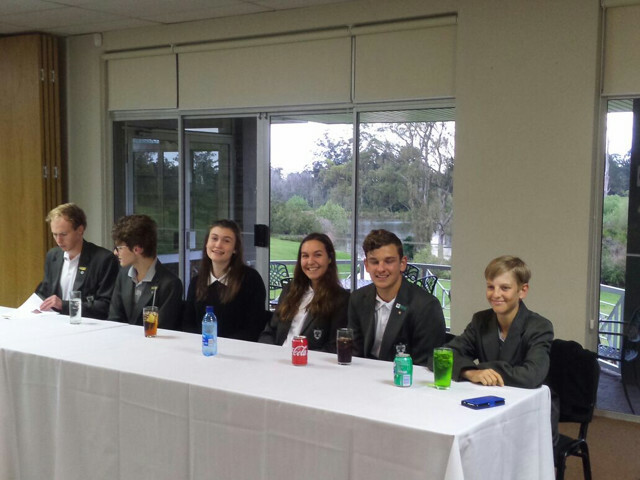 Despite the fact that PP Malcolm was not there to show the Early Actors how to win the raffle, they all participated in a “Junior” version to win a Fanta grape cold drink ! 1,400 meals served at the OCC 2016. Well done Rotary Club of George . Excellent turnout by Rotarians, Interactors and friends ! Thanks to Step Aside and President Martin for preparing the pasta salad, Chris at Amaqueta Food for storing the pasta, Rotarian Francois for the many transport trips,Syd , Christo, Di , Wilhelm ,Daleen Mike and Charles for all the shlepping and carrying and to EVERYONE else involved, GREAT EFFORT and a GREAT PROJECT. Thanks you. President Martin and PP Di represented the Club at the BIG GAME on 30th Jan. Thanks Team ! Interact York & Rundle !! 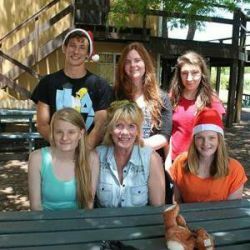 Well done to York and Rundle Interact Clubs who once again hosted an awesome Christmas party for underprivildged children. Well done PP Charles and PP Di, your Interact Teams are stars !! GEORGE NUUS - Lede van die Brackenfell-polisie wat beoog om geld vir die kinders van oorlede polisiebeamptes deur middel van 'n fietstoer in te samel, het Maandagmiddag 'n draai in George gemaak waar hulle vriendelik deur die George-polisie verwelkom is. R93 000 deur middel van die fietstoer en ander projekte in te samel. "Die R93 000 is om die skoolbehoeftes van 93 skoolkinders van gr. 1 tot 12 vanoor die Wes-Kaap van oorlede polisiebeamptes vir volgende jaar te koop," het Kuhn gesê. Kuhn het bygevoeg dat die oorhandiging van die skoolbehoeftes teen einde November sal plaasvind. 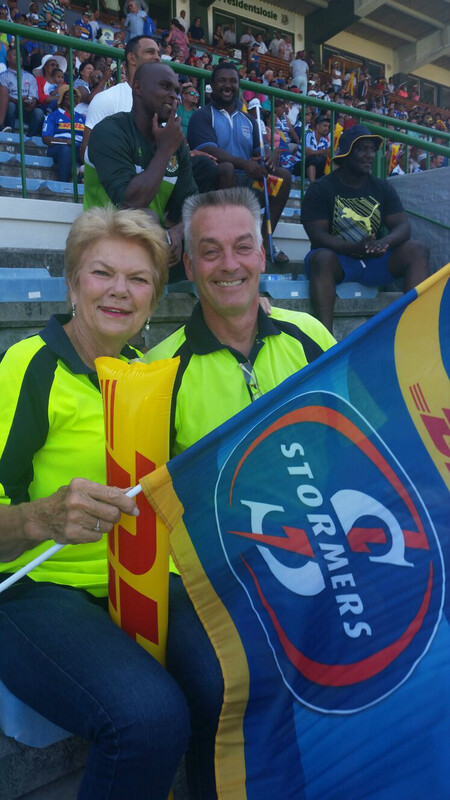 Majoor Elmarie van der Westhuizen van die George-polisie het die groep bedank vir hul inisiatief en sterkte vir hul reis toegewens. 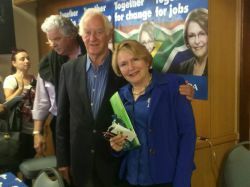 "Dit gebeur min dat daar aan die kinders van polisiebeamptes wat ons in diens verloor het, gedink word. 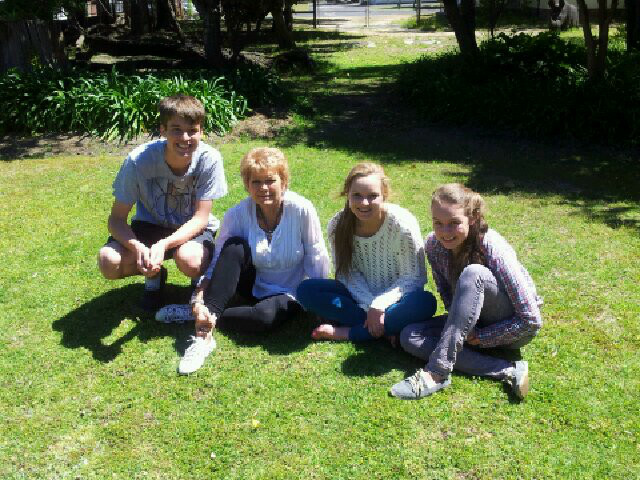 Baie dankie vir wat julle doen," het Van der Westhuizen gesê. Sy het ook 'n donasie namens George-polisie aan die groep oorhandig. 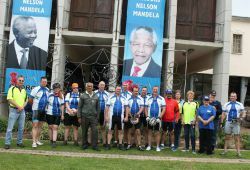 Die fietstoer-groep met lede van Rotary wat ook 'n donasie gegee het sowel as Salie Carelse (vierde van links) voorsitter van die George Polisiëringsforum (GPF) en majoor Elmarie van der Westhuizen van die George-polisie (agter regs). 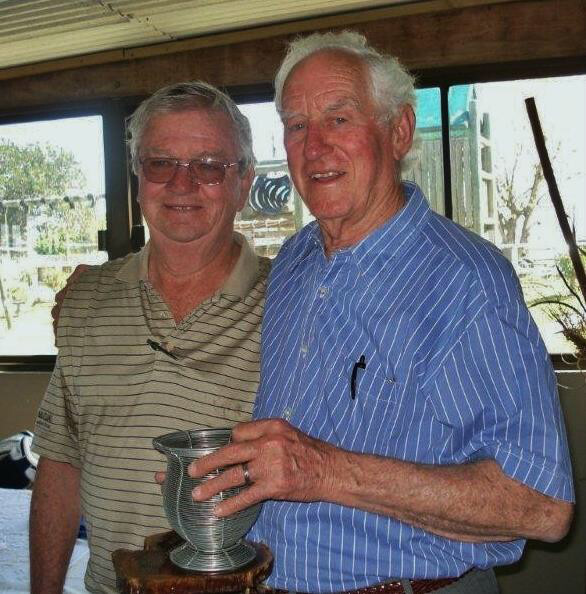 Potjie Kos competition winners - Rotary Club of George - Well done Philip & Francois. 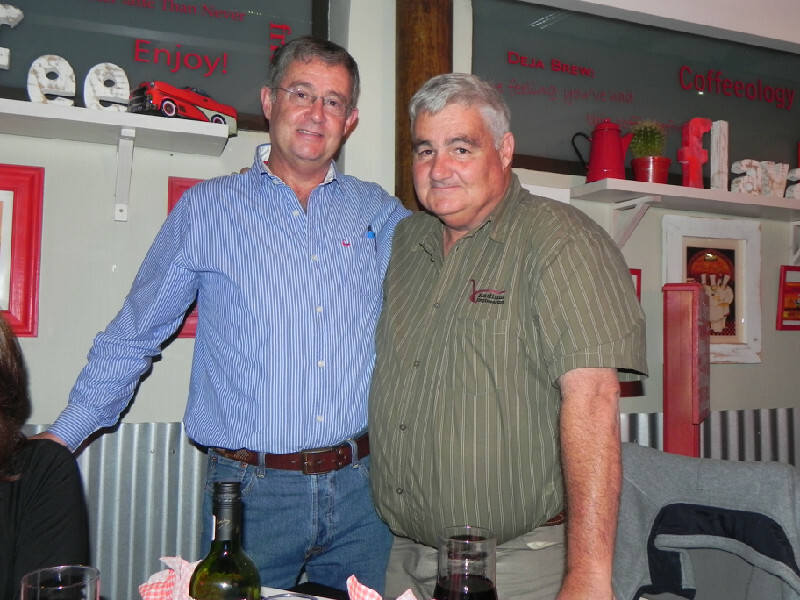 President Martin Reimann was inducted at Down to Earth restaurant near Oubaai , George on Tuesday evening 30th June 2015. Outgoing President Di Kershaw presided over her last meeting and awarded Club Awards to PP Mike Tacke for his stirling work on the Bethesda Medical Project, to PP Jenny Becker for her untiring and efficient running of Club services and her involvement in all the clubs projects. PP Donald Goldfain was awarded the Community Service Award principally on his ability to spend Club funds so quickly and efficiently. PP Phillip Gibbs provided the background music, singing all the popular oldies. Great evening was held by all. 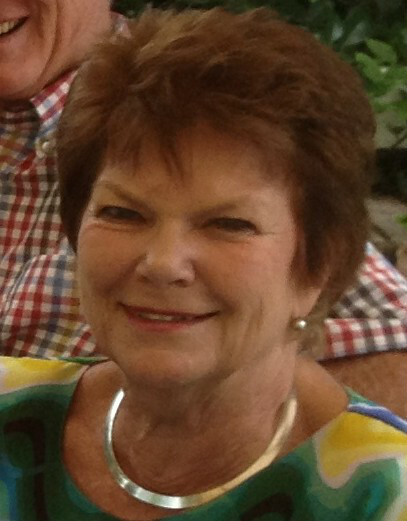 The George Rotary Club has awarded its prestigious Paul Harris Recognition to three community service minded Georgians on Tuesday 9 June 2015. 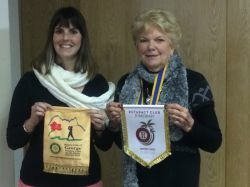 Rotary President Di Kershaw was delighted to award Rotary’s highest award for community service excellence to Helen Grant, who for the past 5 years, twice a week, voluntarily manned the library at Imizamo Yethu High School in Thembalethu, transforming it from an unused room into a living library. 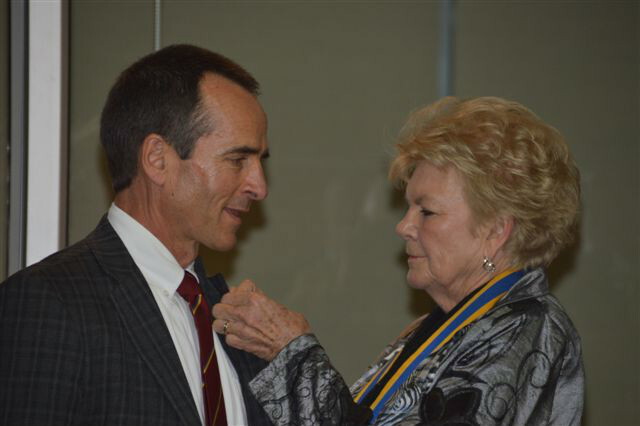 The third award, the Paul Harris Sapphire Recognition was made to Rotarian and Past President Charles Rowe a recipient of the Paul Harris Recognition in the past is further affirmation of his commitment to the George community. He has been the club secretary for 9 years and is known by fellow Rotarians for his four word answer to any question asked, “yes, it is done.” Charles has also dedicatedly mentored the York High Interact Club for the past 25 years. Rotary George handed over a cheque of R11 000 to Hennie Niehaus station commander of the NSRI Wilderness so that the NSRI can make a few small changes to an organization that already runs like clockwork. Congratulations to Pres Di and Daleen Rowe for managing another successful Rotary GOLF DAY . All indications are that the Club will have raised more than DOUBLE the funds in any previous year ! Thanks to everyone who participated, sold raffle tickets , sold Tee's and Greens( especially PP Andrew) , all the sponsors , all the donors, the George Golf Club and staff and WOW , the weather was FANTASTIC ! Great Job Team George ! Great pic of Pres Elect Martin getting into the spirit of the day ! PP Eddie Reppert, Robin Robinson and PP Donald Goldfain represented the Club at the farewell held at Rosemore Old Age Home for Llewellyn Frans, who has now retired after many years of service to Rosemore. Great Food , Great Company , Great Fellowship . Chinese food evening at the Golden Coast Reataurant in York Street George. Very well organised by PP Jenny. Can do this one again. Rundle College Interact Club was Chartered by The Rotary Club of George and the Club members were inducted at a prestigious event held at Rundle College on 24th March 2015. Pres. Alexa Tucek giving her address on the Vision for 2015. Sitting on left: Rob Clark Asst. Governor District 9350 ; Di Kershaw President Rotary Club of George. Wildernarians Moira Culverwell and Loraine Storie were inducted into the Rotary Club of George by President Di on Tuesday 17th March. Watch this space .More Wildernarians to come  !!! 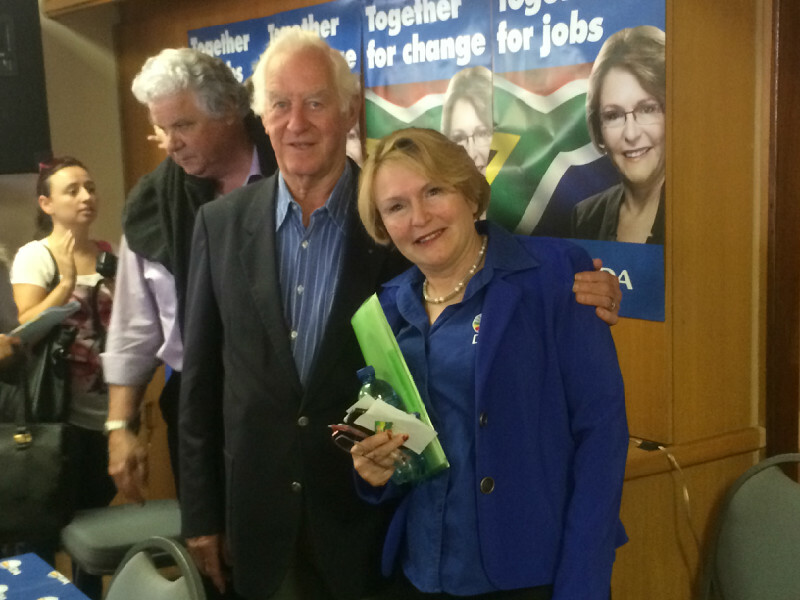 President Di celebrated another Birthday in George at the Club meeting on Tuesday 10th March . Despite being politley asked, Pres Di refused to give her age , other than to advise that it was somewhat North of 21. Rotary visitors Mark and Glenda Liebenberg are pictured her with Pres Di. Judging by the empty champagne bottles, we believe that they will fit in perfectly in the Club. John Sargeant from RC Gloucester in the UK was a welcome visitor. John and his Rotary Club are assisting our Club with the Global grant applications for our current projects. 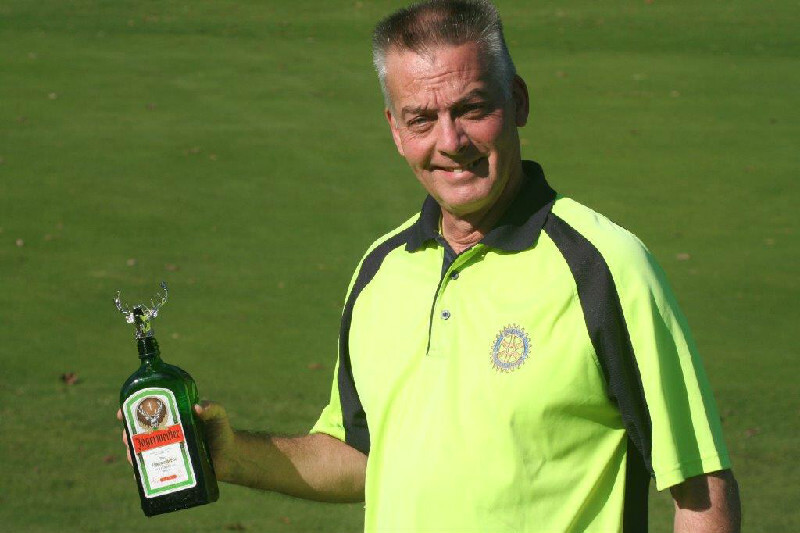 John challenged our three STEP students to do a can can for us and if they would , he personally contributed towards sponsoring a tee and a green at our upcoming Rotary Golf Day ! many thanks John and our STEP students are great sports for doing the can can ! 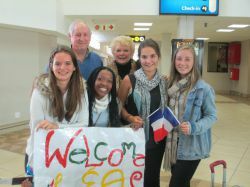 All three York students, Khanyi Mabena ( Deputy Head Girld and Hostel Head Girl) Jenna Seegmuller, ( Student Leader), Margi Naude( Student Leader and Hostel Deputy Girl) and gave impressive feedback reports on their STEP exchange visits to Europe. The STEP programme is such a great Rotary programme. Well done Girls ! The George Marauders , the feared George Rotary Club , successfully raided the Mosselbay Rotary Club. Displaying a distinct lack of courage, the Mosselbay Club were TERRIFIED to display any of their regalia, falsely believing that members of the marauding Club would stoop so low as to steal their regalia ! Happily our banners , flag and gong are back in their rightful place. Thanks to all of you that courageously risked your all for the honour of the Club. The raid was followed by the usual Fish Feast at the harbour. David & Grace Sammut from RC Bolton visited George and visited Bethesda’s “Bolton Kitchen” . A group of Rotarians, including PP Charles Rowe , (who took the photo) joined the Canadians at Bethesda with Bishop Donald Harker and his wife Joan and Marzaan and Madelaine from Bethesda in a tour of Bethesda and the new kitchen. Thanks again to David and the RC Bolton for their help in funding this great project. 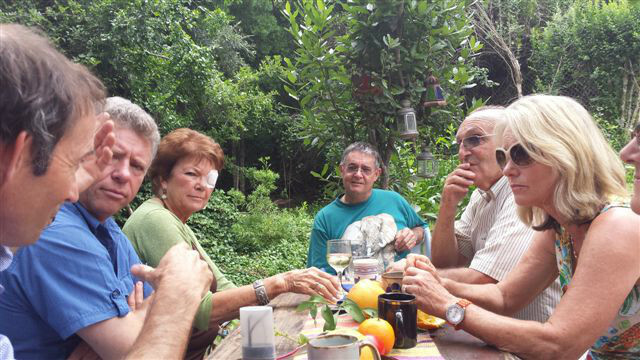 The Club was superbly hosted at the rowan Home on Sunday. Not only did Ferdi and Ian have a beautifully set out lunch venue, a superbly prepared meal and a stunningly beautiful garden , but they were able to organise the most amazing weather. Well Done !! Successful friction fires requires both good equipment and good technique. If you are just starting out, and you won't know if your failures are caused by equipment or technique. This can make learning very difficult. One fix is to buy a good set from an expert. Learn to make fires with it, then make your own kit. Making any fire requires multiple skills, which you apply in a sequence. A friction method will produce a tiny coal. Once you've mastered that, you still need to be able to make the coal in to a flame (with tinder). Once your tinder is going, you need to light the kindling. Usually you'll add progressively larger fuel to grow the fire for your purposes. Then you need to know how to put the fire out safely. 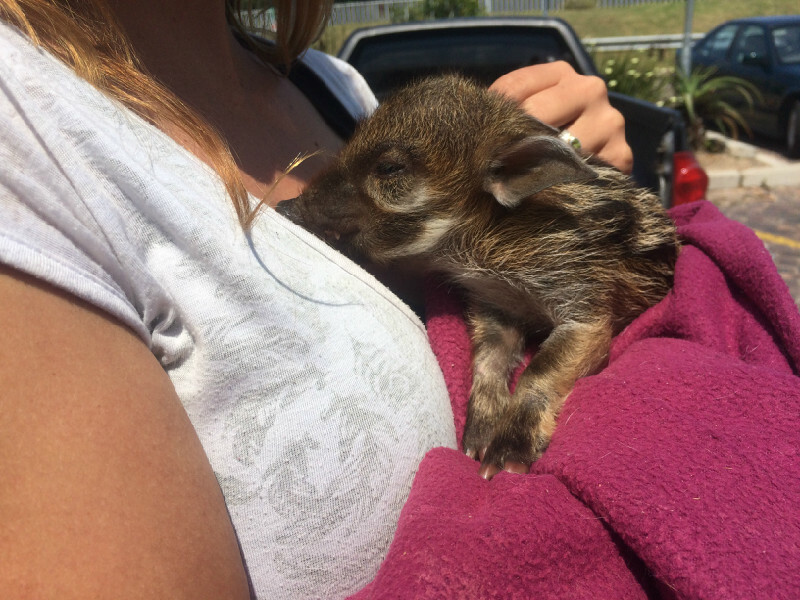 A happily snuggled Elvis Pigsley , the foundling Wilderness Bushpig, exresses his gratitude for being recently rescued on the Hoekwil road. Elvis is the envy of all red blooded males in Wilderness ! York High's Interact Club donated a slide and swing to Akkertjie on the 22 October 2014. The crèche's toddlers- and principle, Davidene Khana - were happy to receive this new addition to their Jungle Gym. The second that the slide was delivered; the children were already on it and eager to play! Interact will continue to give back to the community and we encourage everyone to be the change they want to see in George. Thanks to all the Teachers , Dept. 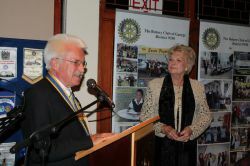 of Education,Rotarians, Ferdi Rowan and Helen Grant that helped make this project a success. Thanks to “Die Bult” for providing the hall again this year . Great Project ! 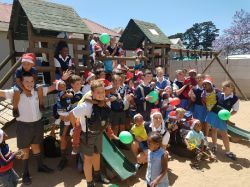 Recently the Early Act Club at Outeniqua Primary School concluded their latest community service project. Early Act is sponsored at primary schools by the international Rotary service organization and includes as focus areas the promotion of a culture of public service, the development of leadership qualities and awareness of community needs. 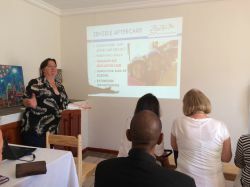 "Last year we became aware of the Wikkelwurms project at Bethesda", comments Amanda Hattingh, teacher and Early Act coordinator at Outeniqua Primary. "The initiative comprises a stimulation project for children with developmental delays from ages 2 to 6 years, with the children coming from disadvantaged families. Last year we reached out to these very special children, and this year we again wanted to do something extraordinary for them. Our Early Actors proved to be more than able for the task." The learners at the Early Act club assisted by their parents baked cakes and arranged for other treats for the get-together. On the day of the visit a group of approximately 40 Early Actors arrived at the Wikkelwurms area at Bethesda, handed over the cakes, and then played with the children in the play area. Food parcels were also left for the children to take to their homes. 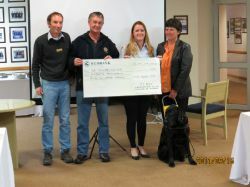 SA Guide Dog Association of SA representatives Teagan Schwerin, Jenny Pretotius and Jenny’s guide dog Kaine received a cheque for R 15,500 towards the cost of training a service guide dog and a puppy . Rotarians Charles McGregor and Donald Goldfain handed over the cheque on behalf of funds collected by The Eden Chapter of the Land Rover Owners Club and friends of the Rotary Club of George. The York High Interact Board and some members , as well as a large contingent of Outeniqua Early Act members arrived to give the Club a presentation on the projects these two Cubs have been involved in over the last few months. The Rotarians and guests present were delighted to see the extent and impact that these young people have made on our George Community. Well done to you all ! The new York High Interact Board was inducted at York High on Thursday 28th August 2014. Guest speaker was Rtn Alex Smith . The evening , under the guidance of PP Charles Rowe was well run and George Rotary can be proud of our Interactors and what they have achieved in the last year. Congratulations to the outgoing board for an excellent year of community service, fellowship and fun.We wish Vicky Boyes, the new Interact President and her board a successful and happy year. Michaela James (nee' Dugmore,) the Interact President at York High in 1989 is now a teacher at York High . see her picture with President Di at the Induction evening. 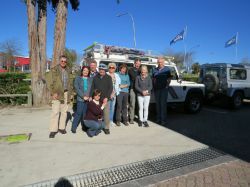 Some of the Rotary Club of George daring members who participated in the grueling off road challenge on Sunday. We were expertly led by our Leader Phillip through a series of almost impassable and impossible obstacles . Despite the fact that we had amongst us some 'almost" 4X4s, we managed to finally make it to the Bush Pub without any breakdowns. Kalahari Ferrari ,. Donald's mighty Defender was ever in the background to offer a tow . Great day and we will do it again ! The Rotary Club of George was delighted to award Paul Harris Awards to three very deserving community service giants. PP Eddie Reppert was awarded a Sapphire Pin for his food project,to add to his previously awarded Paul Harris . Marzanne Cillie of Bethesda received her award for her outstanding working in community service in George and especially at Bethesda and the OCC. Peter Leppan was awarded his Paul Harris for initiating and driving The Seven Passes Initiative. Congratulations to all of you . LeahSurcoff and Ilona le Maitre , our incoming STEP students from Normandy in France , both signing children’s books which the Club will donate to a school library. On the right is Khanyi Mabena our outgoing STEP student. For those that do not know, he RLR was formed at a meeting of Rotary, Lions and Round Table of George. 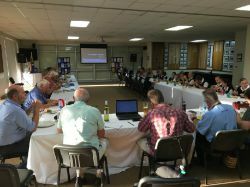 The meeting took place on 18 June 1964 in the offices of NX Hartnady of Rotary and was attended by HA Comay, F van Copenhagen and Hartnady of Rotary, T Stroenel and P van Soelen of Lions and W Steenkamp and P Slabbert of Round Table. The service clubs involved recognised the potential of pooling their resources to work for the elderly and people in need. The concept of a 'Home for the Aged' was proposed and accepted. The George Service Clubs Utility Company was founded in 1970. Kerri-Ann Jeffery , (Andrew and Christine’s daughter who is living in Dubai ), who is the Secretary of the Rotaract Club of Jijumeirah swopping banners with President Di. Devinez les noms dans notre photo de STEP! Rechercher sur le site plus tard dans la semaine et tout sera révélé. 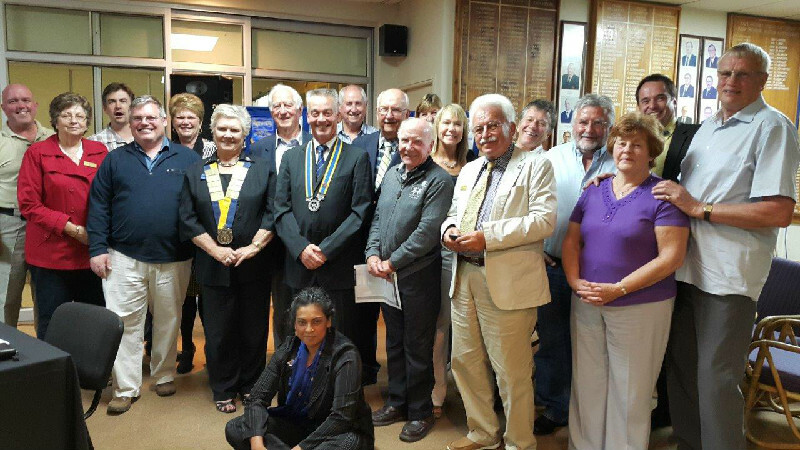 President Di Kershaw was inducted as the Rotary Club of George's President at a prestigious event held at Step-Aside on Saturday evening 28th June 2014. The venue was beautifully decorated by PP Jenny Becker and her Team, the food was cooked and served by President Elect Martin Reimann and his Team and the evening was MC’ed by Rotarian Marlene Viljoen. Past President Mike Tacke gave us a great speech and made some awards to various George Rotarians. PP Phil Gibbs entertained us all with a great repertoire of songs and music. The evening ended just shy of midnight . Great Induction , WELL DONE GEORGE ROTARY !! Look at the Gallery for pics  ! 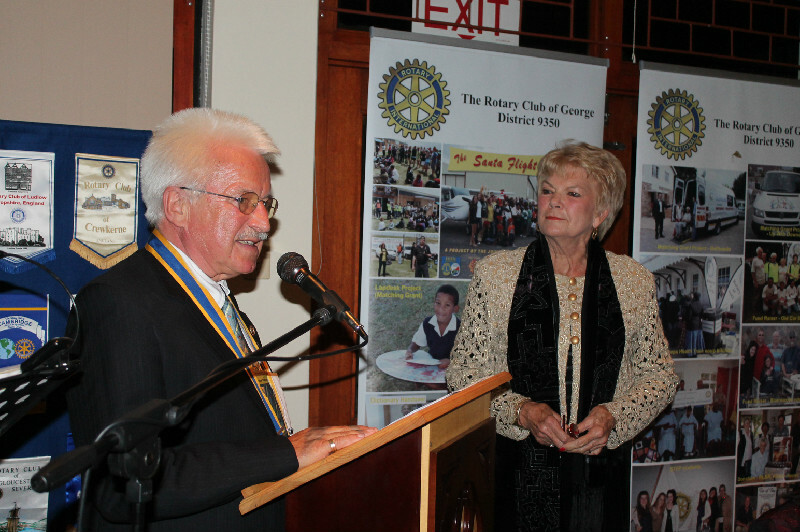 You are cordially invited to attend the Induction dinner of Di Kershaw as President of the Rotary Club of George. The Club's latest pensioner and his twin brother. 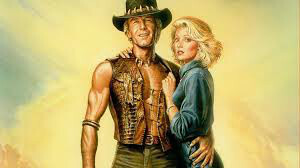 Exclusive pic of PE Di with her date Down Under ! George Rotary Club was represented at the Conference by Pres Mike , Rtns Charles, Jenny, Donald , Martin and visitors Hansie van Vuuren and Rtn Alex Smith , Well run by Knysna Rotary and interesting topics discussed. Yes , we now have our own facebook page !! Now go and "Like Us on facebook" !! Well done Pres Mike & Trevor for getting this off the ground. Seen at a recent Wilderness Premier Event , held at the Faerie Knowe Hotel in The Wilderness , none other than our Club’s very own Paul Harris Fellow , Rotarian Eddie Reppert was spotted with one of his adoring fans. 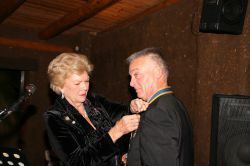 Other celebrity Rotarians seen at this prestigious event were Rotarians Gibbs, Goldfain and Viljoen. 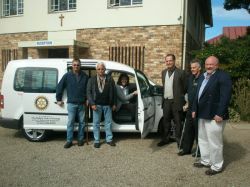 George Rotarians certainly get around ! A Land Rover Load of books and magazines was offloaded this week! Thanda Jesu aftercare and Zenzelle aftercare each received a couple of boxes of children's books and puzzles. RLR's library received two boxes of hard cover fiction books and Imizamo Yethyu school library received loads of magazines and reference books. Thanks to all(including Judy Oberlander at the Anglican Cathedral book stall) who donated books and magazines to this great project. Westin Hotel in Cape Town . The Westin kindly donates it’s older linen to The Rotary Club of Signal Hill. thanks for linen. Well done Eddie !!! 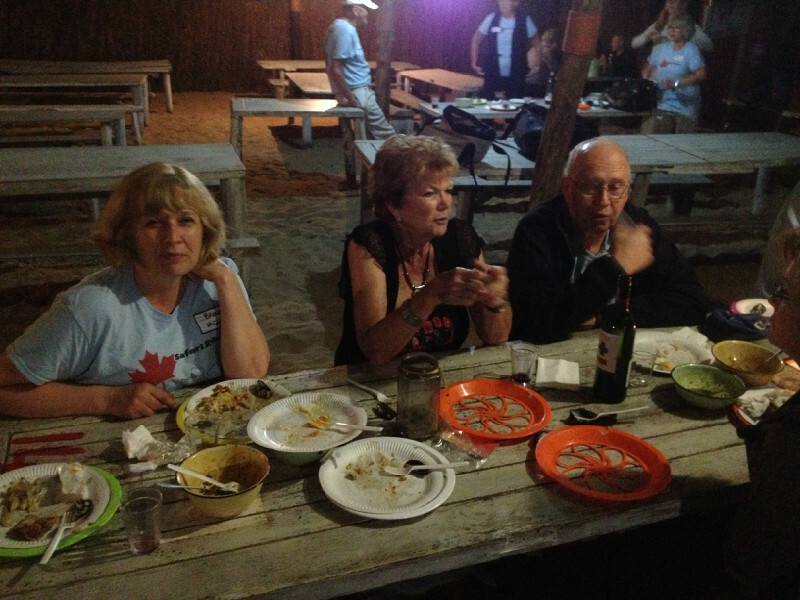 An excited group of Rotarians from the Rotary Club of Edmonton, Canada were "hosted" at De Vette Mossel by Pres Mike & Linda , Charles R , Di K, Donald & Julie at the beach restaurant in Groot Brak. Our guests in fact became our" hosts " when they picked up the tab for dinner and have also indicated that they may well be interested in assisting the Bethesda Project with their fellow Canadians at the Rotary Club of Bolton and perhaps we may end up with enough cash to go ahead with this project. Hold thumbs ! The elegant cutlery , crystal glasses,bone china plates and polished teak floors no doubt made them think that perhaps we also need some help. All Hands were on Deck . Not only financialy rewarding , but loads of fun to . Great Rotary project . Scrumptious Mexican/German/African Breakfast hosted by Herr President Tacke and Frau Tacke ! Great Fellowship and a stunning start to the New Year . Kleva Kershaw , Not a BLONDE anymore !!! 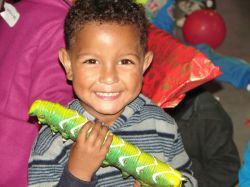 York High School Interact club recently held a Christmas Party for 50 toddlers from Rosemoor and Conville. 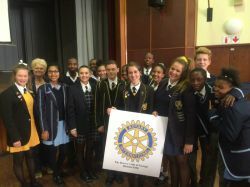 Jane’ Snyman, President of the club says that every year the Interact clubs must complete at least one community service project according to the rules. Snyman continued “together as a club we will tackle issues in our community that we most care about and this is one of them. 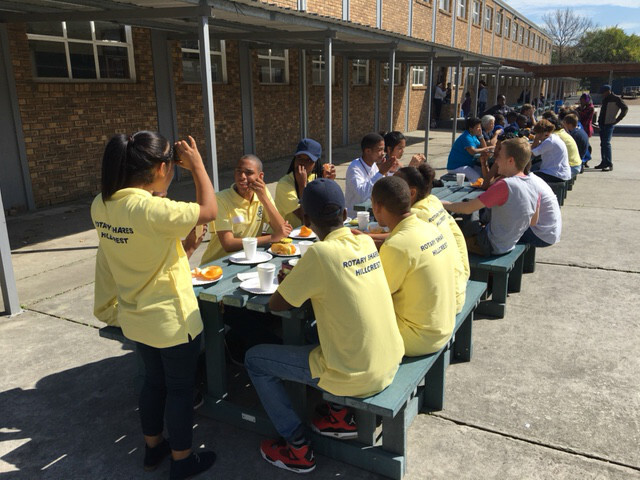 We are developing leadership skills through having fun.” Thanks to President Mike tacke ,Rotarians Charles Rowe, Donald Goldfain and Daleen Rowe for preparing the boere-wors rolls for the crowd. GEORGE NEWS - One of George’s iconic figures, Esther Watson – the founder of the Outeniqua Wheelchair Challenge (OCC) - passed away in the George Medi-Clinic this afternoon. Esther was diagnosed with leukemia at the beginning of last year and underwent a bone marrow transplant later that year. She was re-admitted to the George Medi-Clinic last week Wednesday. She passed away due to lung complications. 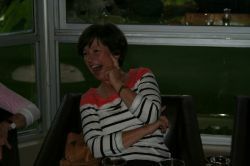 Esther leaves a huge void in the George community and will be missed by all who knew her. 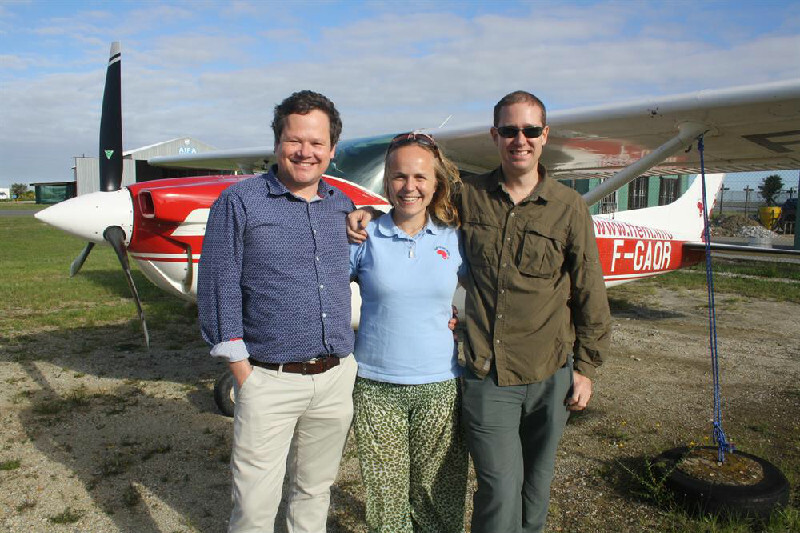 Dr Sophia Webster an obstetrician from the UK, , landed at George Airport after flying about 27 000km in a small airplane, visiting 24 African countries since the beginning of August. Her mission: to promote safe pregnancy for women in Africa and to create awareness of the challenges faced by African mothers, who are much more likely to die when giving birth than European women. Her trip was sponsored by an international pharmaceutical group and Rotary in the UK also assisted financially. 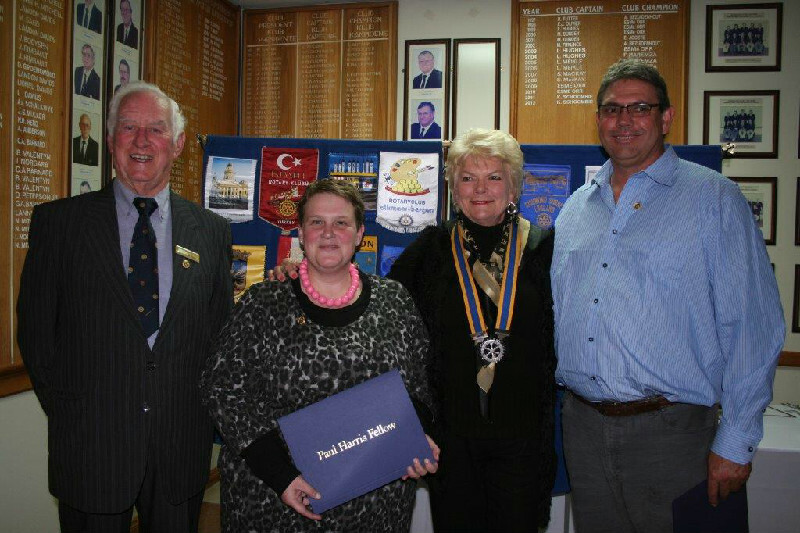 Sophia gave an interesting talk on her epic journey to the George Rotary Club on Tuesday evening 19th Nov 2013. 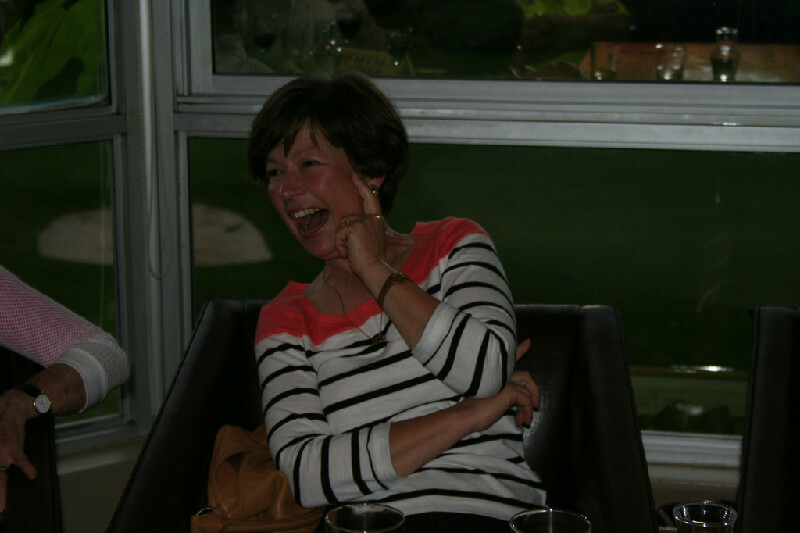 Conveners Di Kershaw and Daleen Rowe rolled out a professional Golf Day on Sunday 10th. The organization was slick, the prizes amazing, the lucky draws outstanding, and the auction a money spinner and of course the weather was beautifully organized. What more could we ask for ?? A Huge BIG THANK YOU to all our sponsors and ALL the donors who contributed so generously towards our prize table. 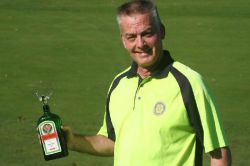 WELL DONE George Rotary GOLF DAY TEAM !!!!!! Wendy & I said when we got home that we had really had a most enjoyable party on Tuesday evening & that it was a long time since we had been to just a super Rotary social. What a wonderful spirit builder these type of meetings can be, as we were all able to move around & talk to members & guests, while Andrew & Mike seemed to look after the majority of the cooking with great aplomb. Ths so much for that guys. People, after digging into the excellent salads, rolls & butter, well done Andrew, Martin & Di you all have hidden talents, just seemed to settle down with their food & form convivial eating groups. 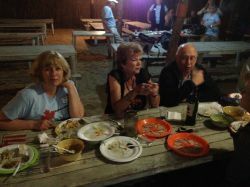 The noise level seemed to rise somewhat and what good service we received from the bar & waitresses. Mike was also a good waiter as he went around offering the dessert, compliments of Mike & Linda I think, which was really well received. Thanks again to all involved with this really good evening. The final 2013 STEP orientation was held over this last weekend.. All the exchange students going out to their respective countries for 6 weeks over the December holidays gathered in Franschoek. This was a week end of finalizing all the travel arrangements. 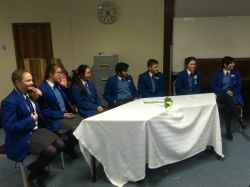 The students had an opportunity to bond – share information – present their presentations to everyone and ask any questions that still needed answers. Members of the District Exchange Committee were all present. Great fun was had by all. Each student was presented with their travel back packs and Rotary Exchange regalia – jersies, hoodies and T-shirts. Di went down to represent the George arm of the Exchange programme. Please all come through to the meeting on the 12th November as the 3 out going students will be coming to the club to do their final presentations to Rotary clubs overseas. Our moment to chat with them and give them all the support they need. They will be flying out on the 1st of December. We wish Candice, Hannah and Michael all the best for their trips to Italy and Germany.Pictured her are Step kids, Michael , Candice,Hannah and Step-Mom Di . The usual crowd of George Rotary Revelers attended the 2013 Round Table melodrama. A great evening was held by all , it was a pity if you missed the fellowship. Rotary was in good company with attendees from all the other George service clubs. Thanks PP Jenny for arranging the Rotary table for the Club. 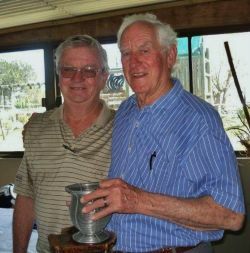 All at the Probus golf day complimented Herold's Bay President Eddie Reppert and tournament organiser Colin Goss and his team for their well-run arrangements that made the day enjoyable for all. 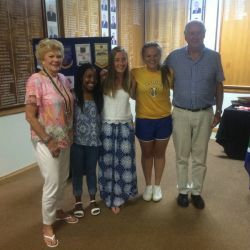 The participating clubs were the host club, Herold's Bay men's club, George Lily ladies' club, George men's club, Sedgefield men's club and Mossel Bay mixed club. Rotary Club of George donated R600 towards this annual event to supply small prizes to the residents at RLR . Seen here are the members of a work party starting with Christmas gifts !!! The Rotary Club of George, together with the UK Rotary Club of Gloucester, Rotary Club of Gloucester Quays, Rotary Club of Sutton Coldfield Vesey and Rotary Club of Pantiles handed over a VW Caddy, 2 liter tdi to the management of St mary's and Betesda today .